On August 15, 2016, nearly six years after I began, I set out on my final courthouse trip. I woke up early that morning to get ready, as I had a bit of a drive before we could get started. I was in Fort Worth, my grandfather in Granbury, and as our path lied to the west, it made more sense for me to come to him than the other way around. So, I cruised down Highway 377 and found my way there after the same forty-minute drive I’ve made my entire life. 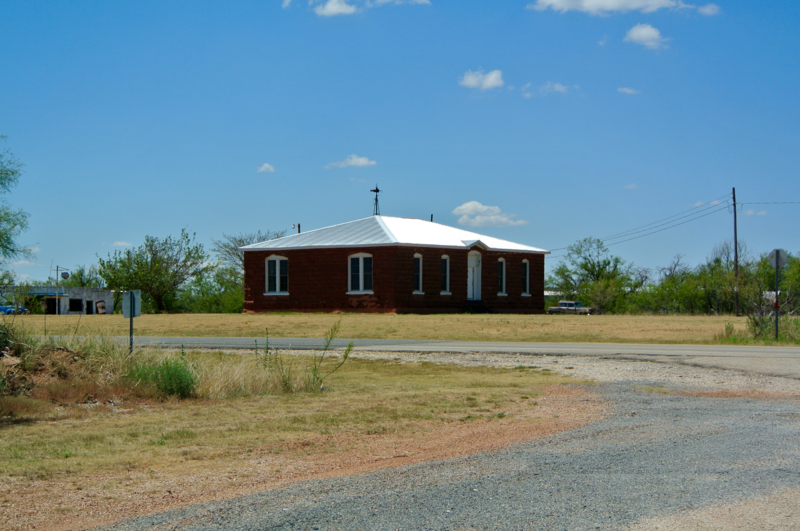 We left not long after I arrived at his house, and around 9:30 we were rounding the downtown bypass loop north of town, and peeling off for Lipan in northwestern Hood County. 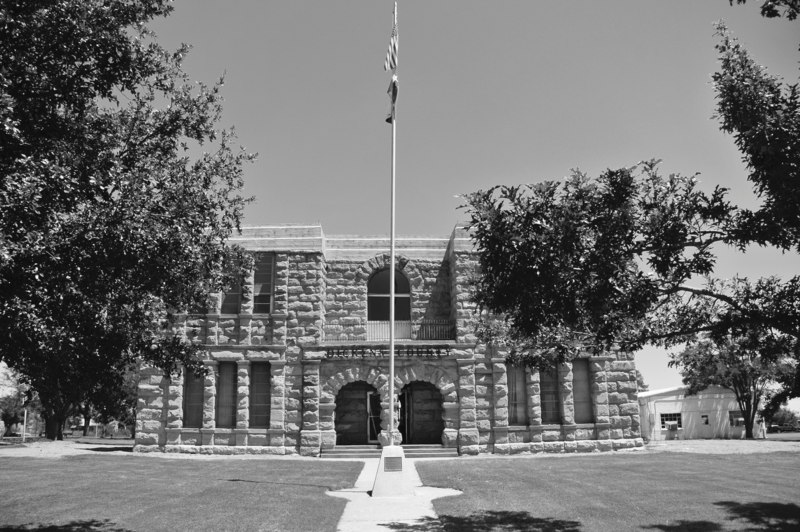 I reflected as we passed the towering heights of the Hood County courthouse on the Granbury square, that in three days’ time I would be poised, at last, to photograph it, my final courthouse. 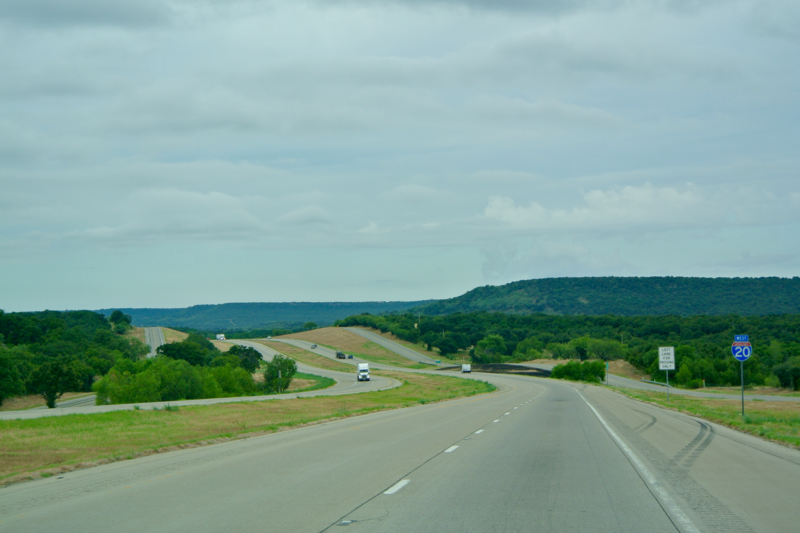 Through Highway 4 to Lipan, we entered Palo Pinto County and intersected 281 (Stephenville-Mineral Wells), choosing instead to keep west. 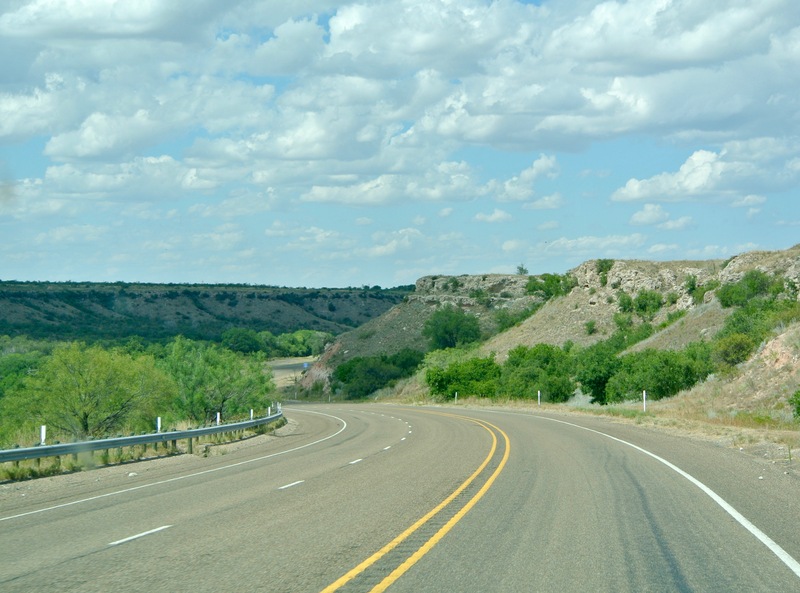 Highway 4 curves northward not long beyond crossing the busier highway, and eventually merges with the Interstate in southern Palo Pinto County. Merging onto I-20 was the next step of our route, and so we joined with the great traffic stream trekking west from Fort Worth and Dallas. Gordon. Ranger. Eastland. Cisco. Baird. Clyde. 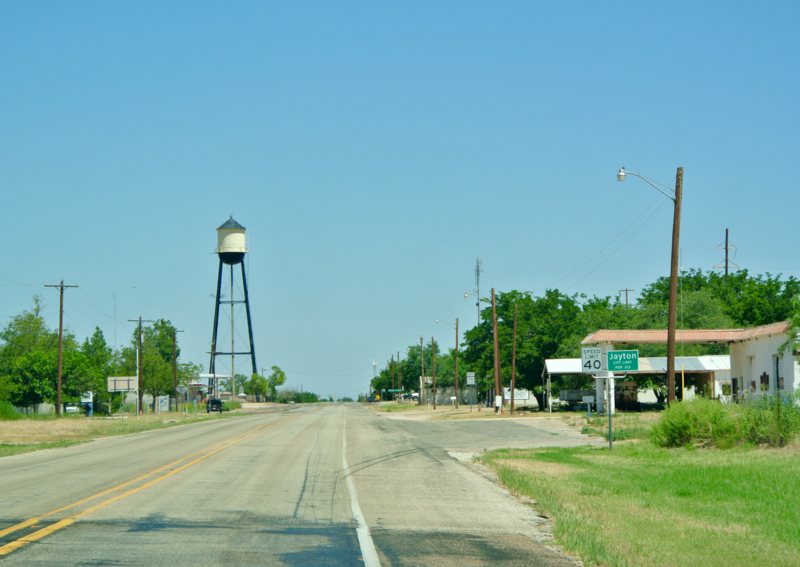 These were the communities we just barely entered as we navigated their rural outskirts along the Interstate. 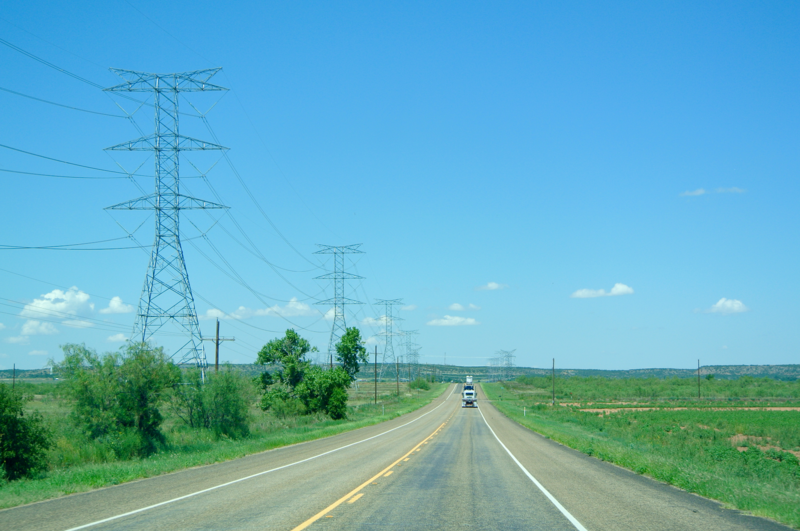 In roughly a good hour and a half, we’d found our way through Palo Pinto, Eastland, and Callahan Counties to enter Taylor County. All of these, of course, have been visited to date. Unfortunately, “backtracking” to familiar places in this project is extremely common, especially since all of these counties’ seats lie on, or just off of, one of the busiest thoroughfares in the state. 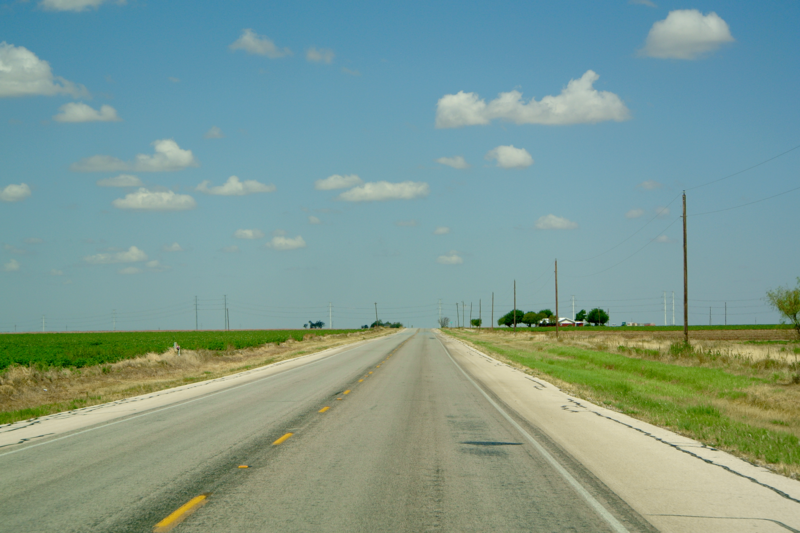 Having no business in Abilene (the Taylor County seat), we continued the drive by peeling off to the north and heading out to Jones County. There, their county government is centered in the city of Anson. We remarked later that Anson was most likely, out of every city I’d seen to date, the one we traveled through most in this project. 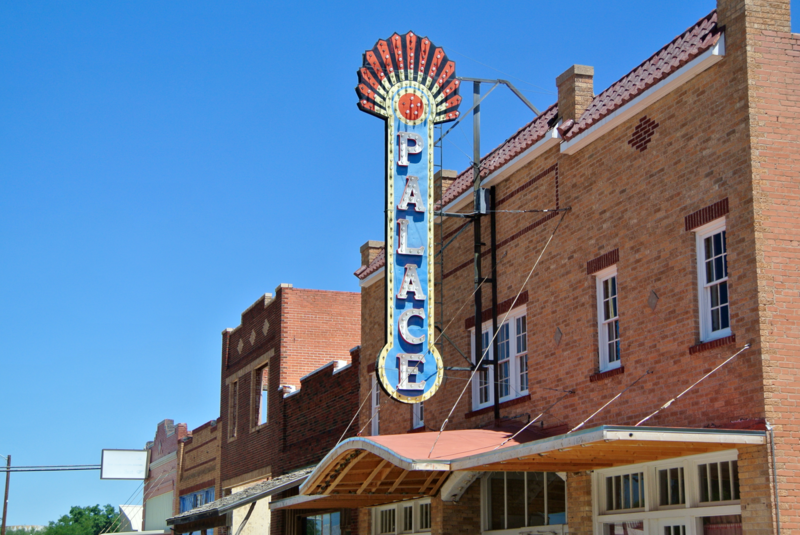 I can recall passing through the heart of its downtown district more times than any other city’s, except perhaps Hamilton, Meridian or Glen Rose. As it always is, the Jones County courthouse was a welcome sight. Anson’s one of those places that I’ve never been to more than just a handful of times, but somehow it still seems so familiar. I can count six times to date I’ve been through it, two from this trip alone. We came home through the city as well. This was the only trip that we’ve ever done both, coming and going. Outside of this low plains town, the city rapidly drops away and yields itself to fields and fields of money makers: cotton plants. This region’s soil is extremely popular for the cash crop, and you can be sure farmers take every advantage of it. 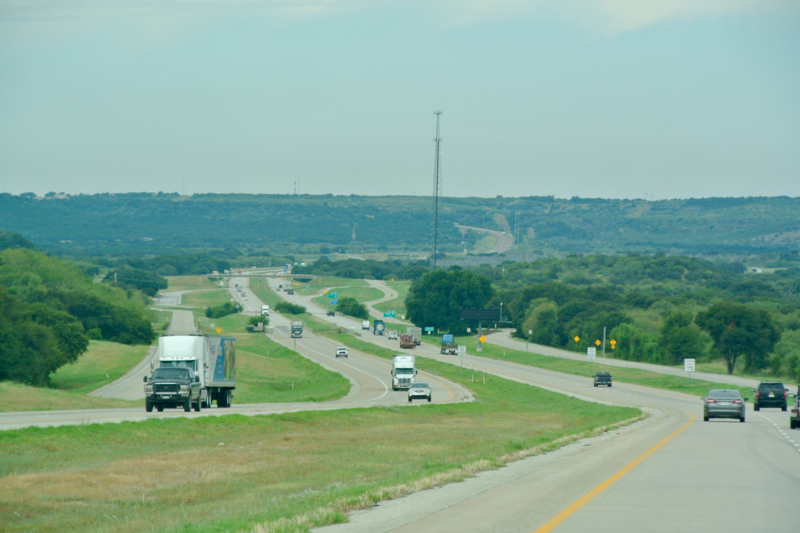 All the hills of the I-20 corridor from Abilene eastward fall steeply away here. 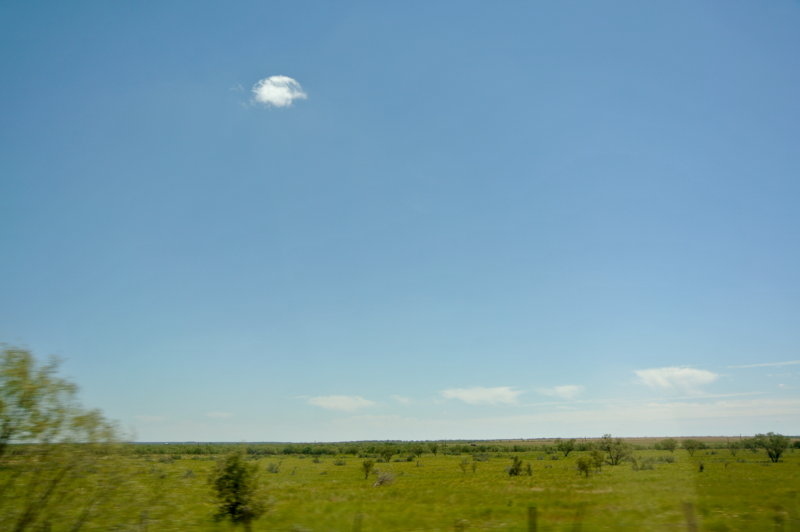 Around Anson is a world of nothing but flat, unrelenting prairie, dominated by the emerald green leaves of cotton. The only trees are those planted by farmers around their homes. 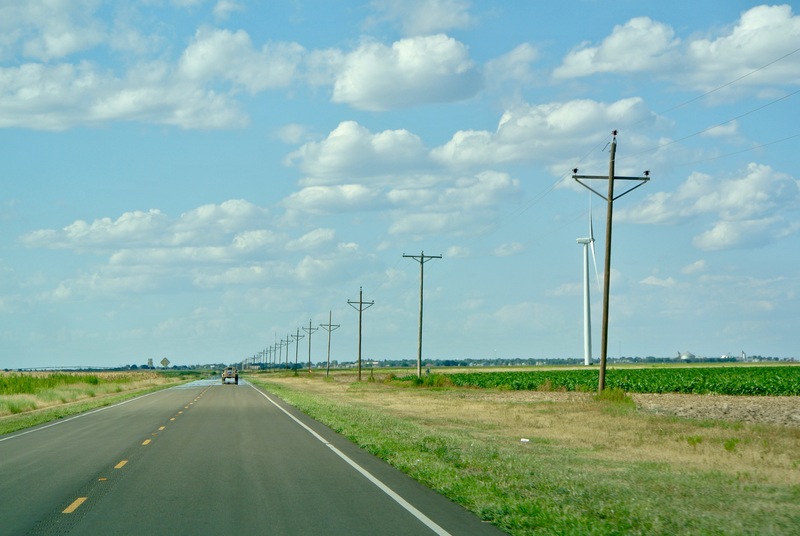 Far more plentiful are the barren, thin, tree trunks that we use as telephone poles. It was nearing the twelve o’clock hour now, and we were still in familiar territory. However, that region didn’t end in Jones County. With a nearly cloudless sky, we kept on. Hamlin was next, in the same county. What we found odd enough was that on a peak summer day like this, the temperature had remained fairly constantly in the 80s. That’s odd enough in Texas, but made even more odd by August in Texas, and even stranger yet because of the region we were in. By noon, I’d expected to be contending with the high 90s, but the highest the thermometer got the entire day was 93 degrees. It was a well appreciated cold front. (And yes, a high of 93 is a cold front in a Texas August). 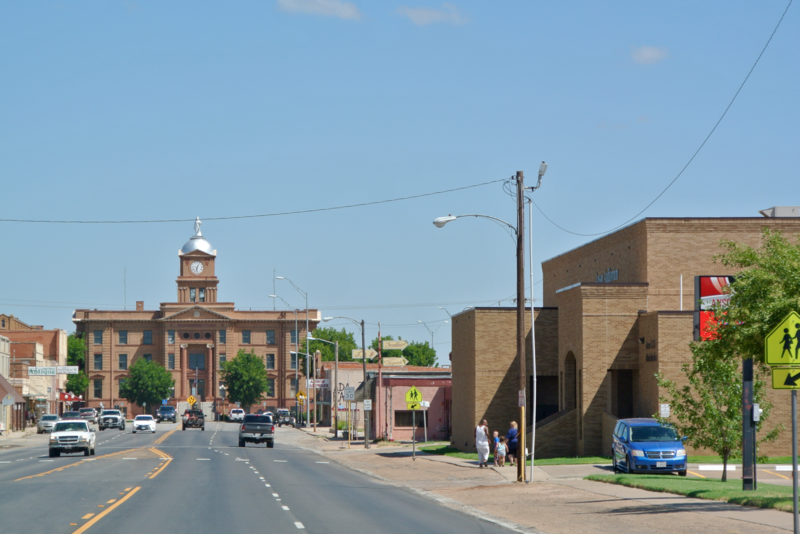 In Aspermont, the Stonewall County courthouse greeted us from the left side of the road, but it’s nothing impressive, and since I’ve already been by it (three times), I didn’t feel any need to capture another shot of it. 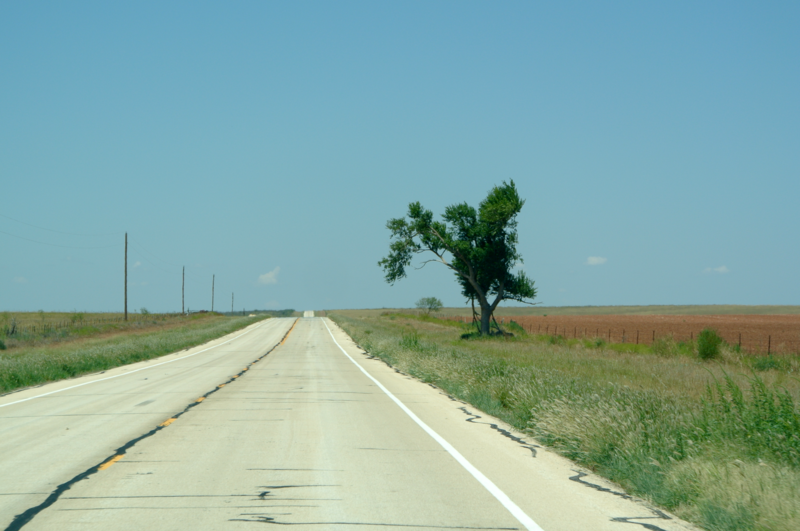 North of Aspermont, we bore left off of Highway 83 to 380. It was around 12:30, and we still had yet to gain any ground. It was some kind of record, I thought, about how far we’d had to travel before getting any new courthouses. 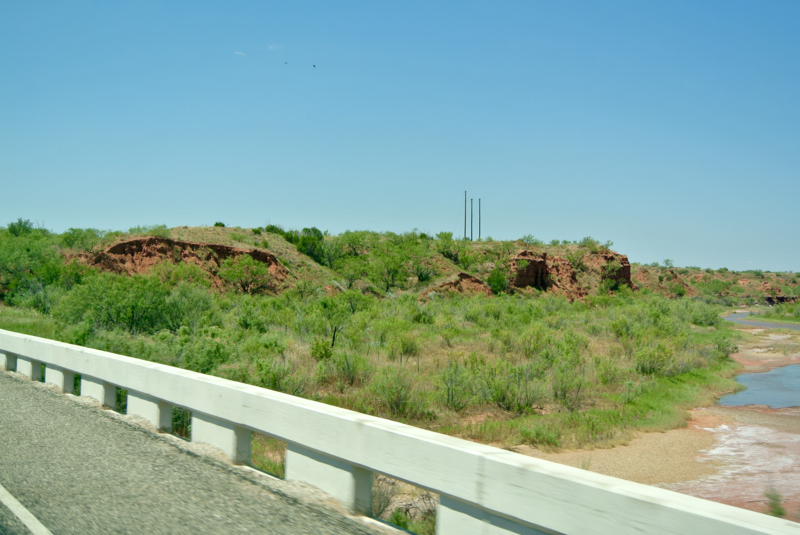 The terrain beyond Aspermont turns rough and rugged again. Mesquite trees hog nearly everything in sight but the highway itself, and the flatness we found outside of Anson had retreated back to a variety of hills and gulches. But in the likes of thirty minutes, we had traced our steps west of Stonewall County, back to Kent County, for the first time in three years. My original trip here was part of a large haul I’d made returning from Colorado and New Mexico in the Summer of 2013. At the time I’d just barely cleared ninety counties, and Kent made 91. We pulled our RV into the county seat of Jayton, and as I did, I took a few measly photographs with my iPhone camera (none of which did much to actually capture the courthouse properly). Three years had gone by since I’d last been there of course, so the only thing I could accurately remember was the stillness of the little city. It’s a stretch I’d say to call it even a little farming town. Kent County wasn’t made for farming, not at least from the terrain I saw. 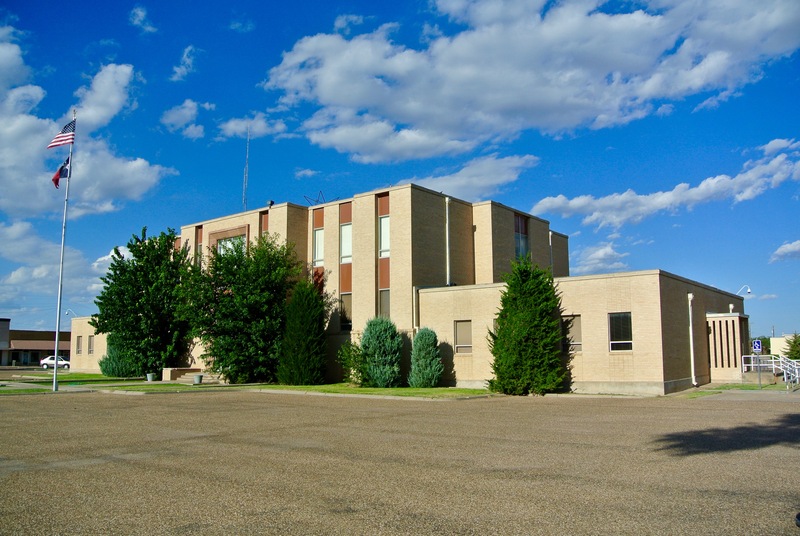 Jayton is just an isolated little spot on the rugged plains, but one that has a surprisingly modern courthouse. Wyatt C. Hedrick was the architect of this building. It was constructed in 1957, and is the second and most recent structure to serve as the center of county justice. At this point (August 15, 2016), I was still reeling from my trip the previous month to East Texas. 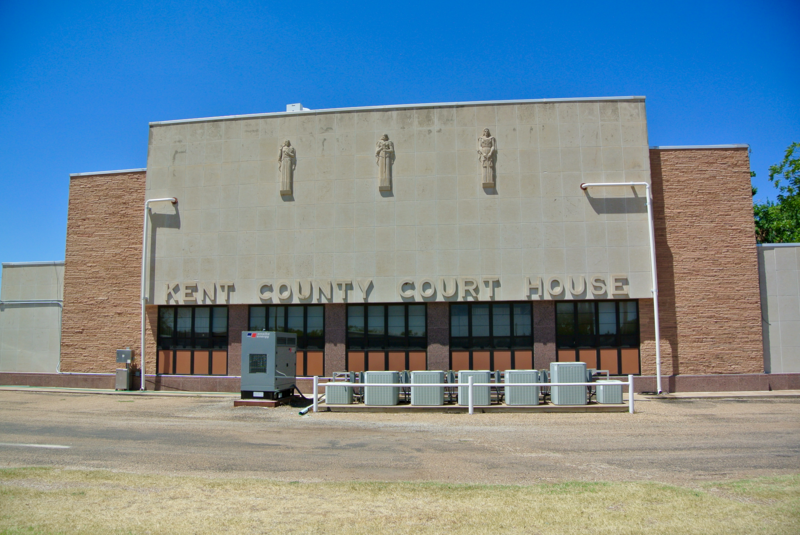 You’ll remember my chance encounters with some wily characters in Tyler and Angelina Counties involving taking photographs of their respective courthouses. At the time (July 12), only five days had passed since the tragic shooting of five officers in Dallas on July 7. The first incident in Woodville I let roll off my shoulder as an unfortunate reaction to the previous week’s attack on law enforcement. The county employees were (rightfully, I guess) nervous about someone walking around their courthouse, snapping pictures. But the harassment I got in Lufkin was a bit different. I left that city feeling more than just a little assaulted, as the encounter I’d had was neither justified nor polite. Regrettably, I was feeling disillusioned about this project of mine. I kept that in mind as I began photographing the catalog of this final trip. Only eleven courthouses remained, other than any I revisited like Kent County’s this trip, and I began counting them down with each stop. I was hoping that I wouldn’t have to feel the brunt of any other hyped-up, jumpy security guard whose demonstrated personality gave the impression that he lacked anything close to the temperament the job demands. So, when I opened the Kent County courthouse door and stepped inside, I was mindful that I might get questions. I’d had some cards printed up for that very purpose, spelling out my name and what I was doing. I kept a small stash in my pocket nearly the whole trip. 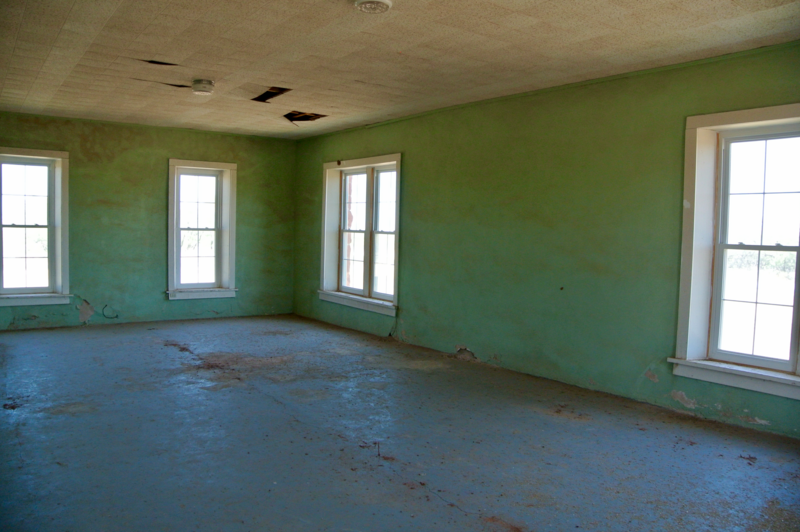 But as I peered into the county offices, and took a few shots of the first floor, I was surprised to find myself alone. The courthouse was dead. The lights were on, the doors were unlocked, but I was the only one there. With that in mind, I had full reign. I didn’t sneak a peak into the county judge’s private office or anything, but I took my time in the darkened courtroom and felt the liberty to turn the lights on to get some better shots. There was no one there to protest me (a welcome relief since the last trip). 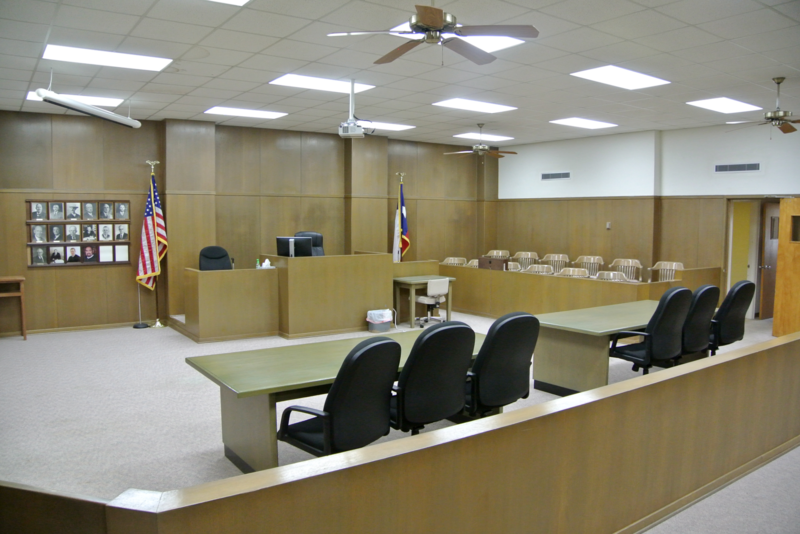 Here’s a few shots from the district courtroom. A sampling of past judges is what you see on the left side of the room, back wall. Aside from the dropped ceiling and updated furniture, the sleek brown walls look like they have largely remained the same since their origins in the fifties. As far as the outside of the courthouse was concerned, I began on the side of the main entrance, facing west at a perpendicular position with Main Street. 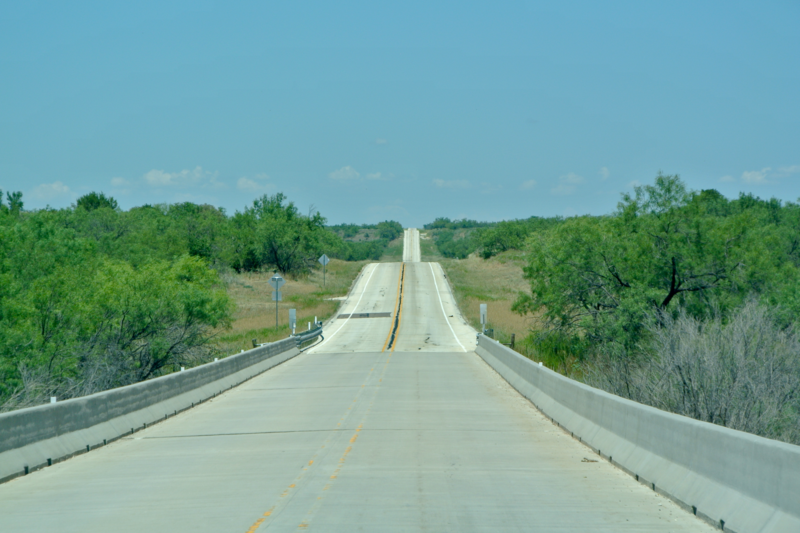 In less than half a mile from the courthouse doors, Main curves away (and out of Jayton completely), turning into FM 1083 and winding its way south to Highway 380. I followed the courthouse north next, and worked clockwise in a circle. One county employee arrived at that point, and she and I kept a mutually wary distance until she entered the building. On the backside, the courthouse’s rural location becomes even more evident. This façade bears a good resemblance to the front, except for the fact that the air conditioning units have surely been added since ’57. It’s not as picturesque as it may have once been. My overall opinion of this courthouse? For a modern structure, it’s pleasing enough to the eye. I can say that about most all of Wyatt Hedrick’s works. He was a fine architect, and while the Moderne style doesn’t rank among my favorites, he worked with what was popular in his day, and he did it well. What I just find particularly odd about this one is how it looks like something you’d find in a bigger city environment. 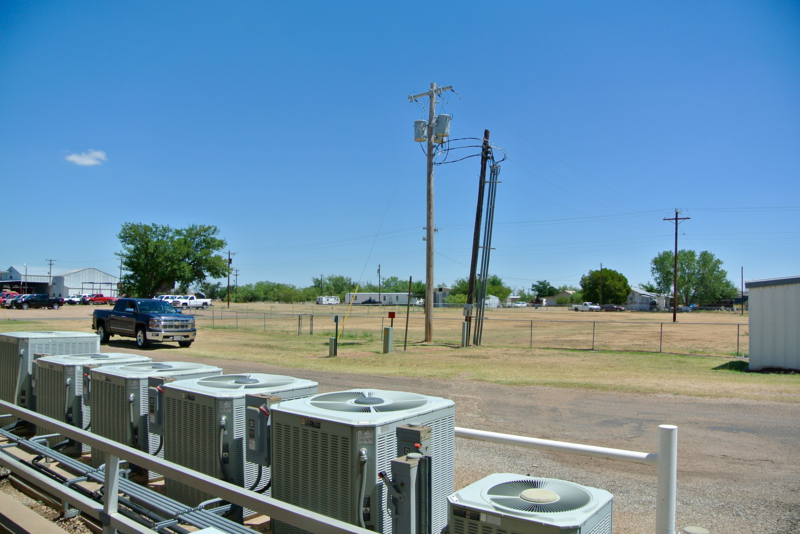 Something like this I think I could see right at home in a metropolitan suburb, not little Jayton near the Caprock. The Panhandle is almost completely covered with rural communities with their own modern courthouses, but this is the one which, upon my first look, just completely looks out of step with the tiny community it serves. To me, sitting there just off a country highway, it looks almost out of place. But Jayton and Kent County got lucky. This court building looks much nicer than most all of the rest of its modern field. Nowhere else will you find charming ornamental detail like those three stone warriors. Such designs were uniquely Hedrick. Jayton happens to be as far north as he ever went. I’m glad I got the chance to go back and do this one justice. In 2013 I was just too inexperienced to get the right photos. Inexperienced and fairly ignorant towards county history. 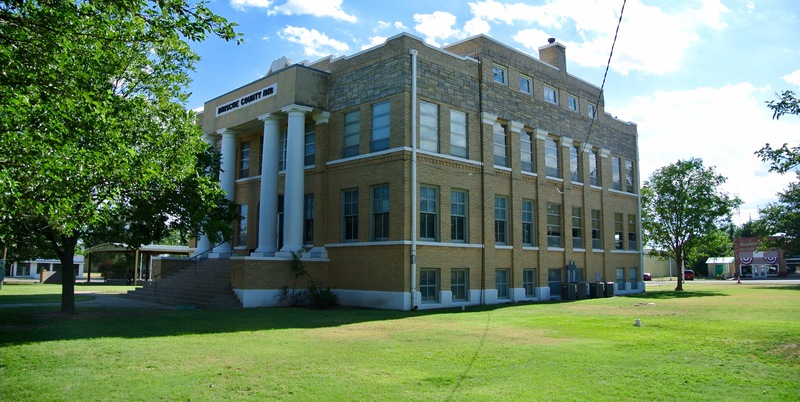 Later that summer, I’d encounter my first retired courthouse in Irion County. Before then, of course, I hadn’t really confronted the prospect that the courthouse on each city square may not have been the only one in each county. As a result, I discovered later that there were a few select communities I’d passed through with retired county courthouses that I had just simply missed. As I’ve said before, the courthouses no one uses anymore are the ones I find the most interesting. 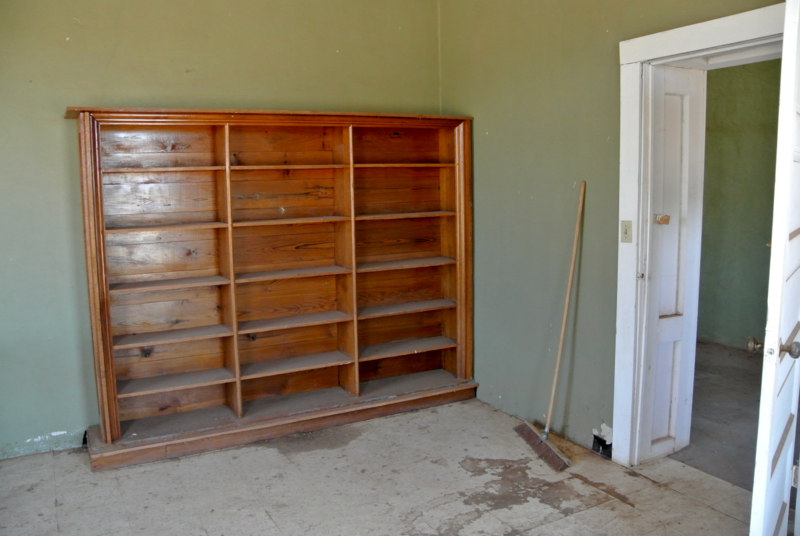 Often times they’re nearly abandoned, and their hallowed, empty walls hold the best stories. 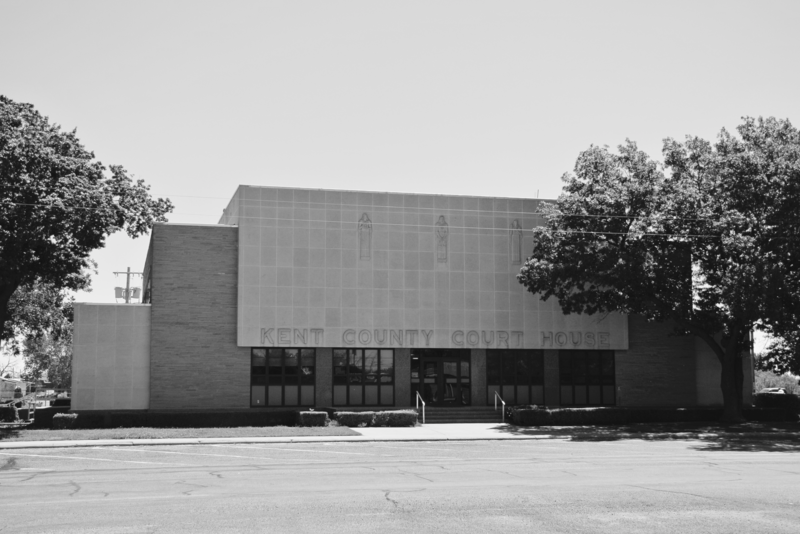 Sometime after July 28, 2013 (when I first drove through Kent County), I discovered that the 1957 courthouse in Jayton was the second county building. The first, constructed in 1895 (three years after the county was organized), was built in the little town of Clairemont. It still stands. 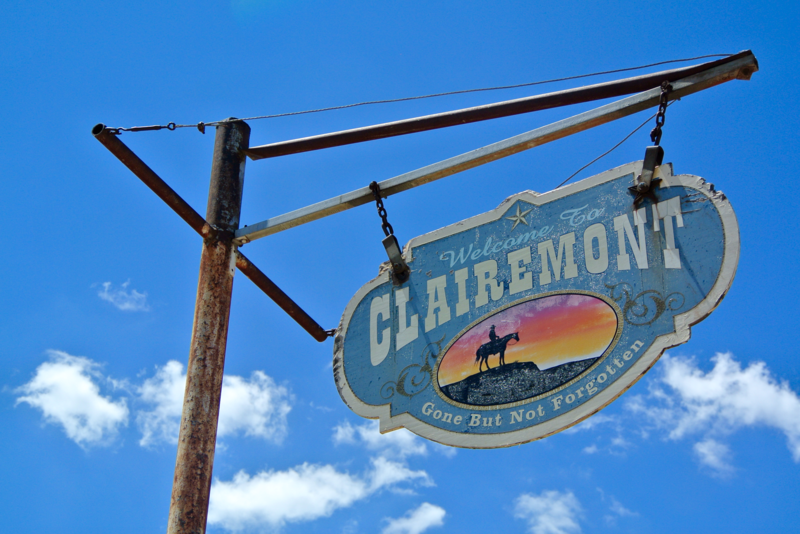 Clairemont is roughly fourteen miles southwest of Jayton and has been a ghost town for nearly its entire existence. As of 2015, Kent County is the fifth-least populated county in the state (approximately 700 people). Its numbers have never been much higher than that. 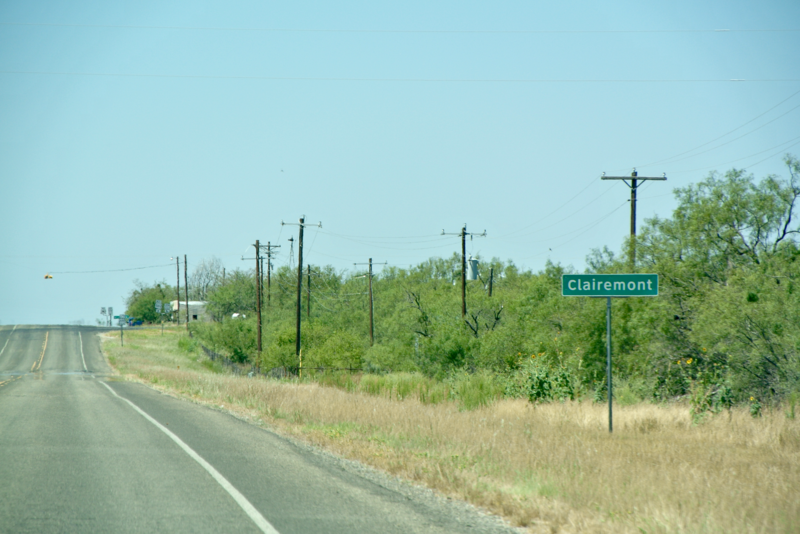 In the fifties, Clairemont reached a peak population of about three hundred people. But as these things go on the rough, unrelenting plains, the town didn’t have enough water to sustain that population. 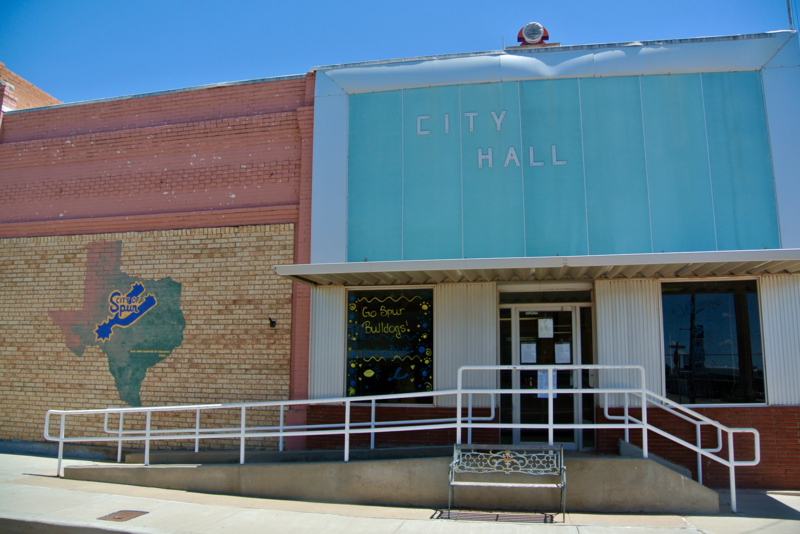 After an election in 1954, Jayton was adopted as the new county seat. And today, Clairemont’s official population is approximately fifteen people. I didn’t see any of them while I was there. 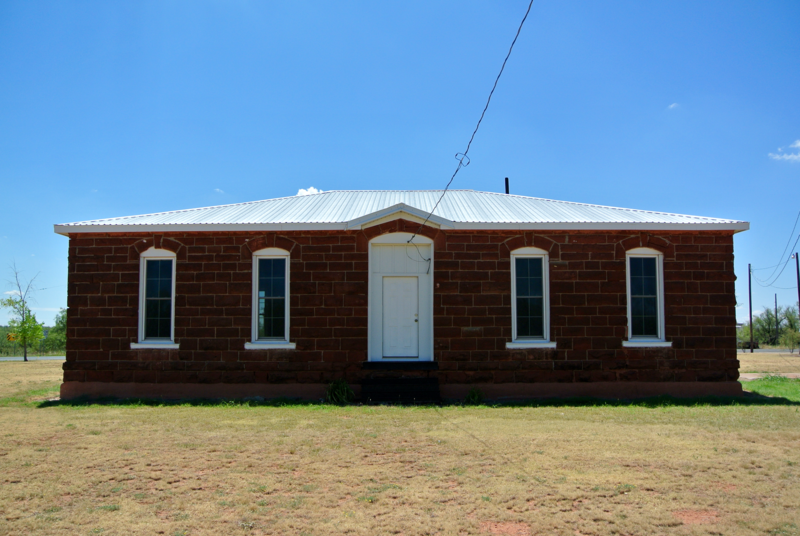 So, we headed southwest from Jayton and made for the original county seat, with the goal of stopping by the tiny retired courthouse the community still boasts. 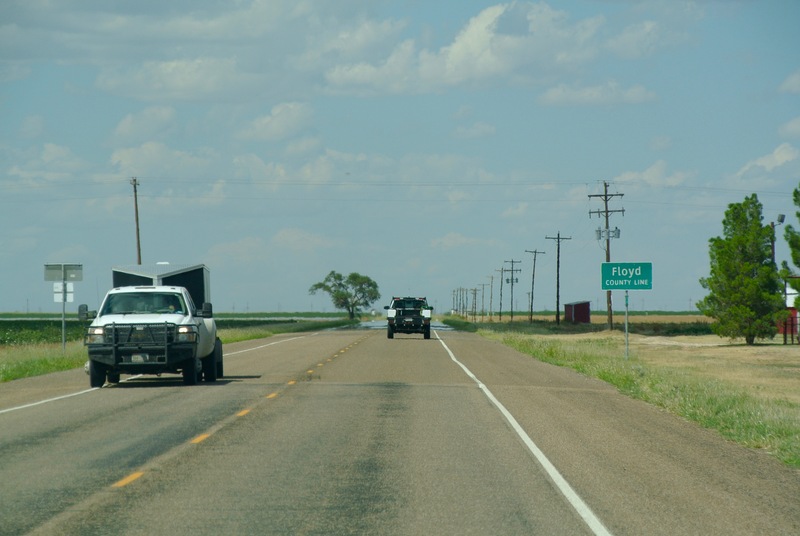 I don’t know about other states, but in Texas, you can tell a town is small when the highway sign advertising you’ve arrived doesn’t bear a population count. This was the case for Clairemont. Ahead, you can see the town’s single, blinking light. Above is the view one has pulling up into Clairemont from Jayton. 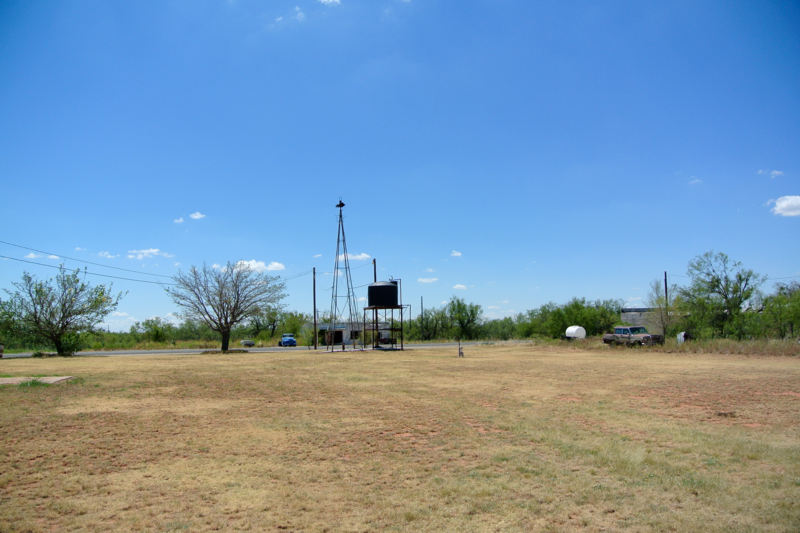 This is the totality of the town, except for a sparse number of tucked away homes and the old county jail. This building, the only one of any remarkable characteristic, was the old county courthouse. Originally an Italianate structure, its appearance today is a far departure from that of the late 1800s. If you looked at a photograph of the original design, and then my picture from 2016, you might not recognize the same building. (Photo Courtesy: TXDoT) This image is from 1939. On April 12, 1955, not a year since losing its county seat status, Clairemont’s courthouse burned. Fortunately, this occurred only shortly after all county records had been moved up the road to Jayton. The roof, tower, and second floor were completely destroyed in the blaze, but the county was able to salvage what remained of the ground floor. Today, this single-floor, red brick, isolated edifice is all that exists to remind us of what Clairemont once was. I’ve read that today it’s utilized as a community center. I’d believe that, if only there was an actual community to serve. There’s a few people left in town, but by the building’s condition, I can tell you it’s not used at all. In the years immediately following 1955, Clairemont might have had good use for it. But the little town went on to experience more pain. 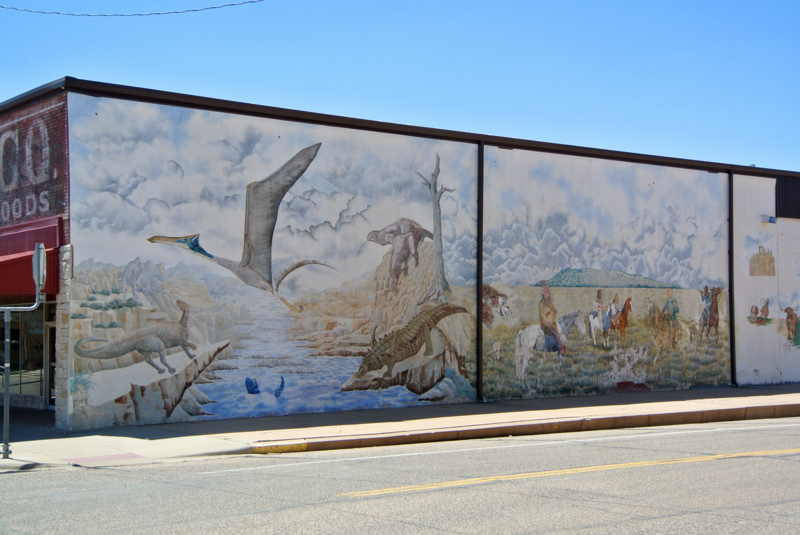 At some point following, the Kent County school system was consolidated, and Clairemont’s education was moved to a school in Jayton. The post office finally had no choice but to shut down by 1970. The last business closed its doors in the nineties. It’s a heartbreaking tale that’s only too common. For someone like me, traveling to these places for the first time in the 2010s, I can only use my imagination to think about how they thrived sixty or seventy years prior. Sometimes, there’s aged reminders still barely sprouting from the faded plains (like the old courthouse), but most times there’s nothing left but stories to read. It’s a story that tugs at your heartstrings, or at least, it did mine. I consider myself lucky to have all of those things this poor man lost. Memories of childhood are still youthful in my mind, and my cherished home of memories still stands. I feel for this man who had to painfully return to Clairemont and see what’s become of it. Above is the view across the highway from the courthouse. 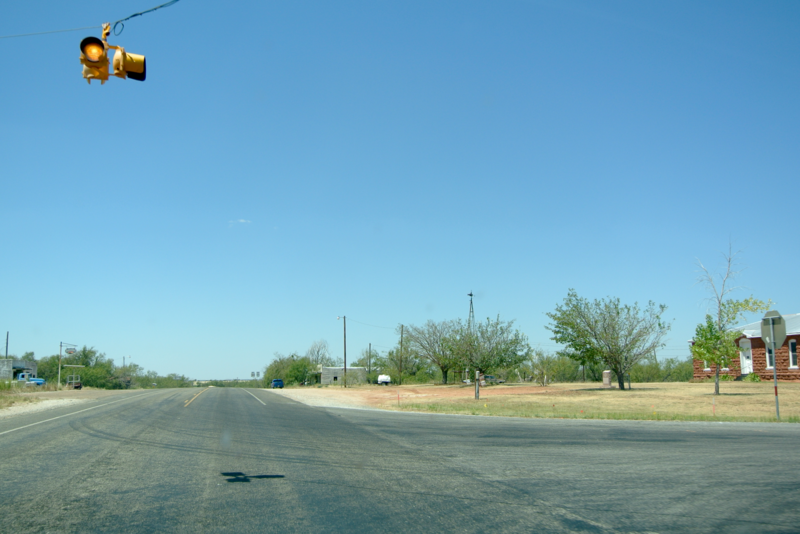 Infrequent cars zoom down this road from Post to Jayton, or from Jayton to Post at speeds so fast they probably don’t even register the blinking yellow light telling them to slow down. No one’s got any time to spend in Clairemont. What really is there to attract anyone except the lone photographer like me? It’s more than difficult to imagine that this courthouse was once the center of all traffic and activity in the county. 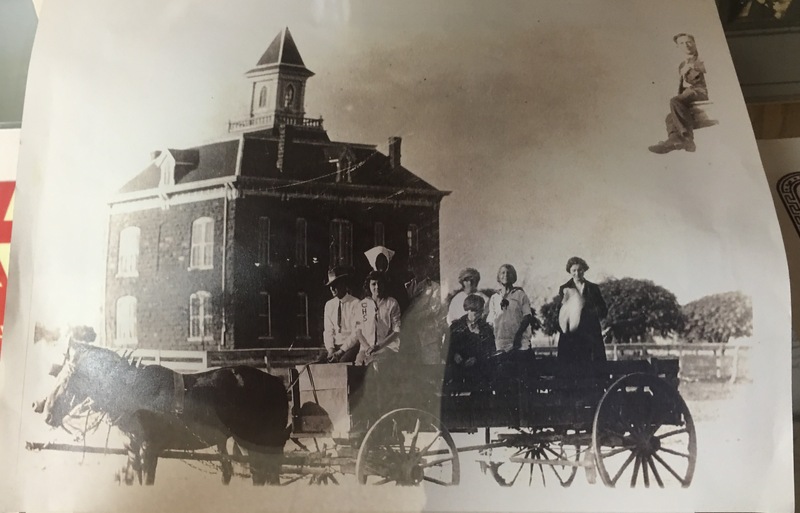 I found an image on display in the current courthouse that offers a bit of perspective into how life in Clairemont looked in the early twentieth century. The man in the top right corner is sitting on the roof of the Clairemont Hotel, a small caption read. It was apparently located just northeast of the courthouse. I can tell you that no such building exists today. Life in the little town has certainly changed. These two shots go along with the above historic image. The first is a rough equivalent of the same angle of the courthouse in the old picture. They’re not exactly the same, but the corner and sides seen of the building are the same in both images. 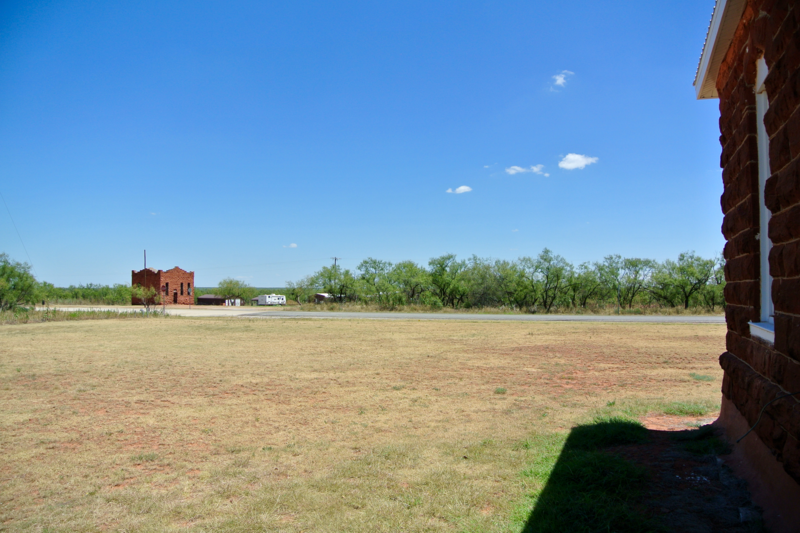 The second photo is a look at what lies northeast of the courthouse today, and where a hotel might once have stood. 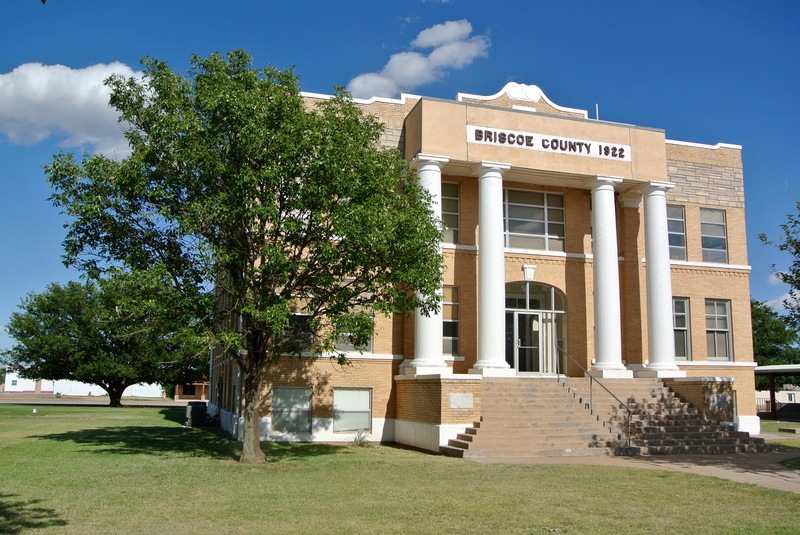 As I walked around the courthouse taking photos, of course I was reminded of the retired Irion County courthouse in Sherwood. 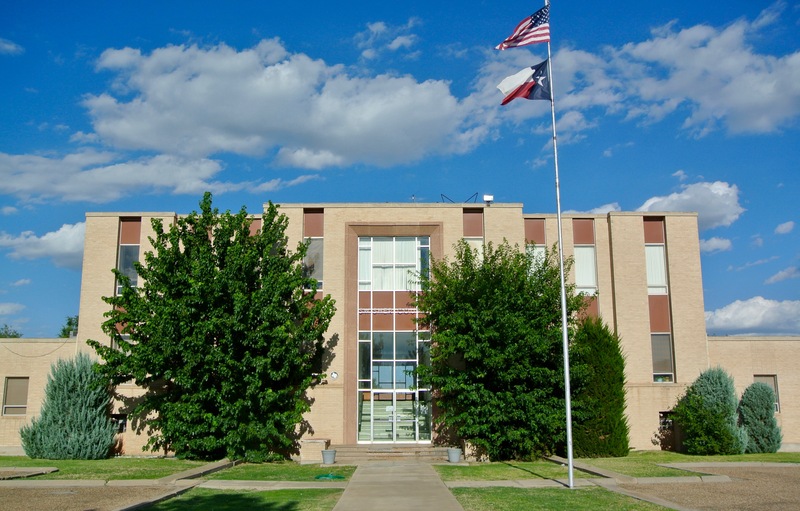 In all my time of visiting older courthouses, this one bore the greatest connection through memories to the hallmark of Texas’ retired collection there in Sherwood. There is something significant in how they are both almost forgotten treasures lying just off the highway (Sherwood is off the highway by about two miles or so, but still…), large prairie tombstones standing in remembrance of lives that once were. 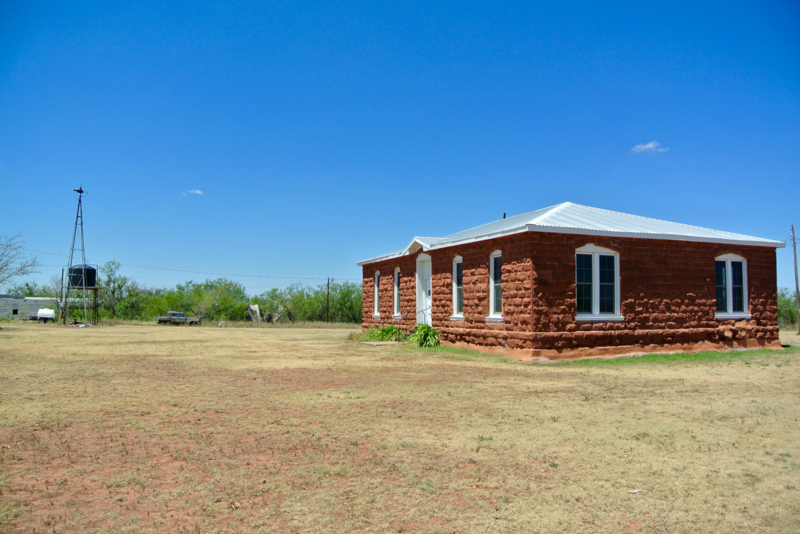 Communities have come and gone on the Texas plains, but those that leave behind buildings like this are really something, in my opinion. 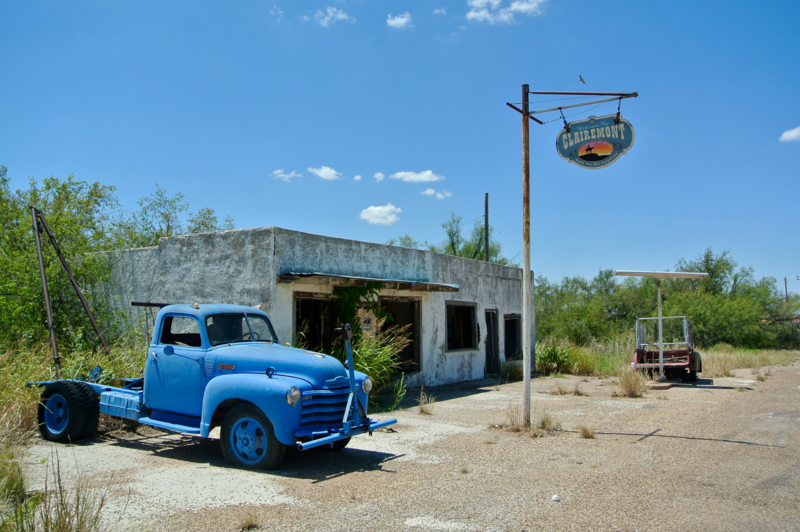 Old stores, old post offices, old schools, old homes…you see them all the time in these little ghost towns. 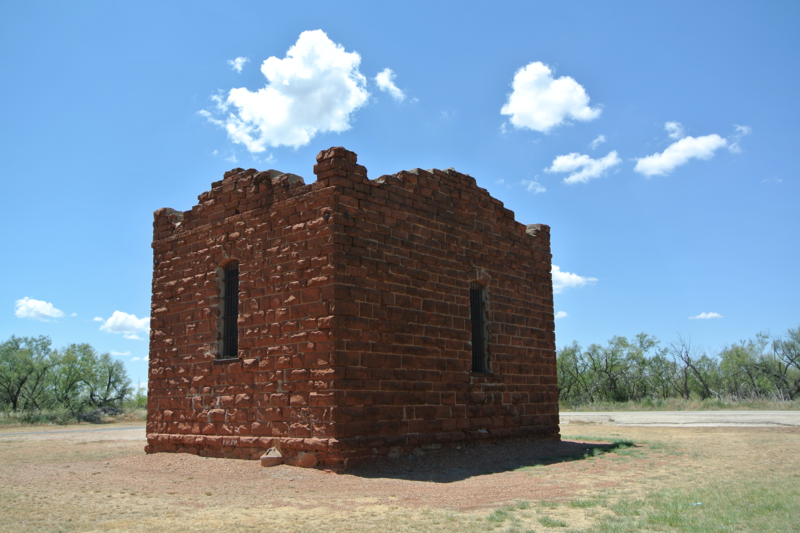 But how often do you see an old courthouse, still left to rot away among the plains? 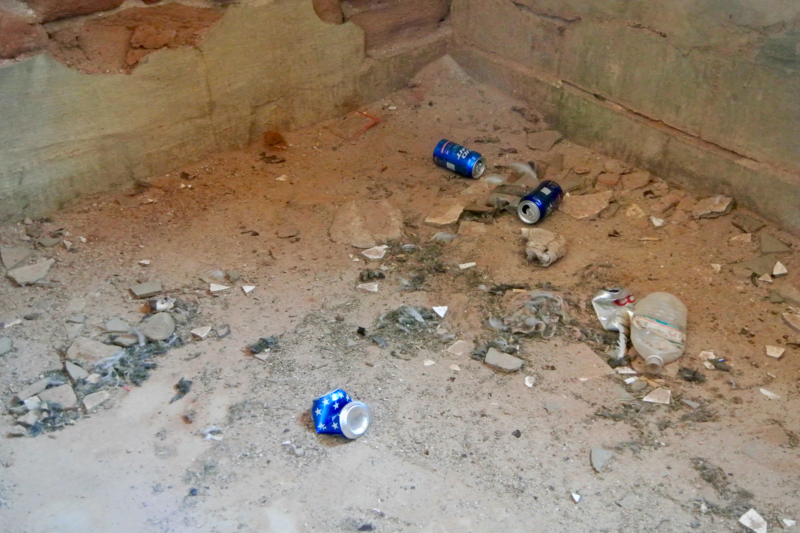 What the Clairemont courthouse does is something no historical marker could ever manage to do. It remains behind to tell the story of a city all but forgotten, a story I can’t tell. I didn’t live it. This little courthouse saw everything Clairemont was or would ever be, from the archways of its doors and the eaves of its windows. From 1895 to 2016, it has seen it all. 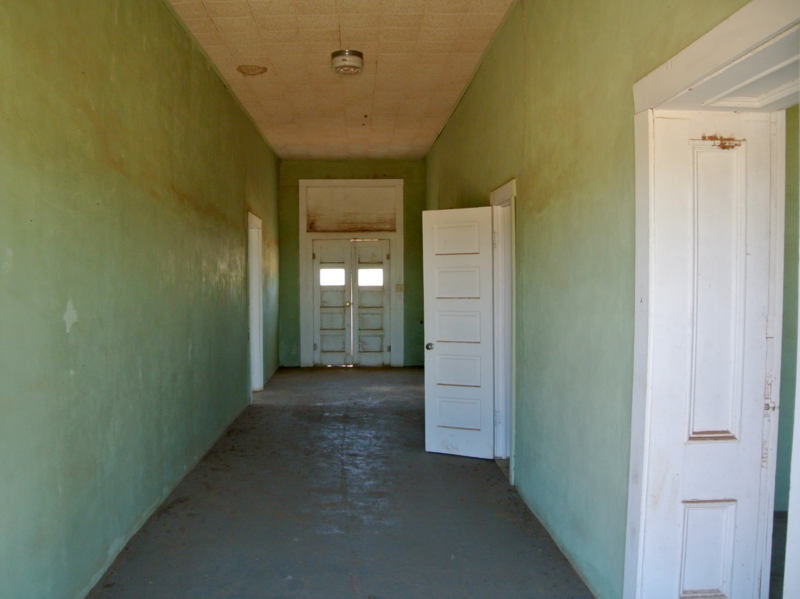 I walked around to its backside, facing north towards Dickens County, and approached the doorway. The first thing I noticed was that the years have worn away the back steps so badly that they’ve actually detached from the building. 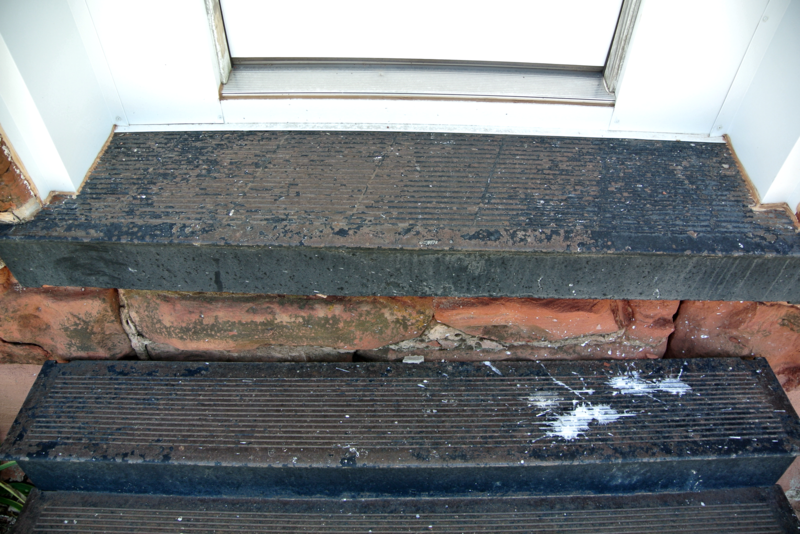 I climbed the steps gingerly, making sure to be alert in case they fell out from underneath me. But, I guess they’re dug into the side of the wall pretty hard, since they held in place well enough for me to step on the little landing you see there. Here’s the view from the backdoor. 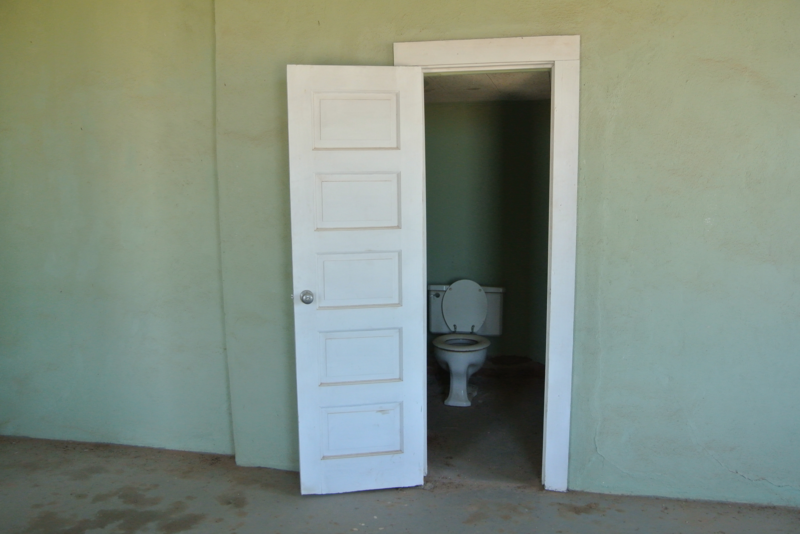 Just for the sake of trying, I decided to try the doorknob, and to my complete surprise, the old wooden door swung open. Surprisingly enough, it’s not locked. That’s probably because there’s nothing inside worth stealing. And as it is listed as a community center, I didn’t consider it trespassing. Here’s the view upon entering the back door. I did a quick tour of the aging courthouse, and then hastily made a retreat. There really was no one in Clairemont to protest me being there, but I didn’t want to take any chance on anyone pulling up and asking questions. Everything this was once is long gone. It’s just a shame. I exited the courthouse then, and proceeded around to the west side. 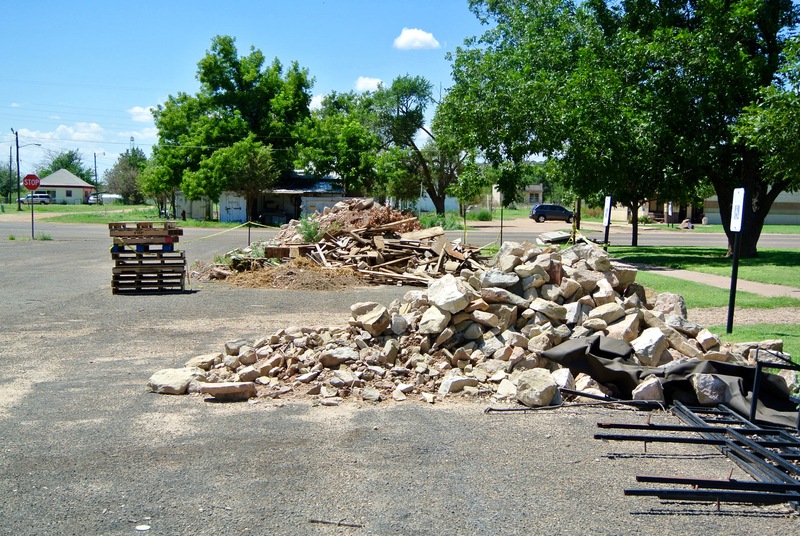 What you see below is the remainder of Clairemont from the courthouse’s southwest corner. The white building on the left is the only home I saw in the entire town. Half of this is certainly true. However, unfortunately, I’m not sure “not forgotten” is appropriate. The original Kent County jail, one of the oldest historic county jails remaining in the state, is just a catty-corner northeast of the courthouse. If nothing else is forgotten, it’s this. Since it was constructed in 1895 (the same year as the courthouse), it has virtually retained its complete, original appearance. This is the definition of a wild west jailhouse. Could you imagine being locked up in this thing? The door was hanging open when we arrived, which made us think someone was working inside. Come to find out, it’s just rusted open that way, and has been for years and years. 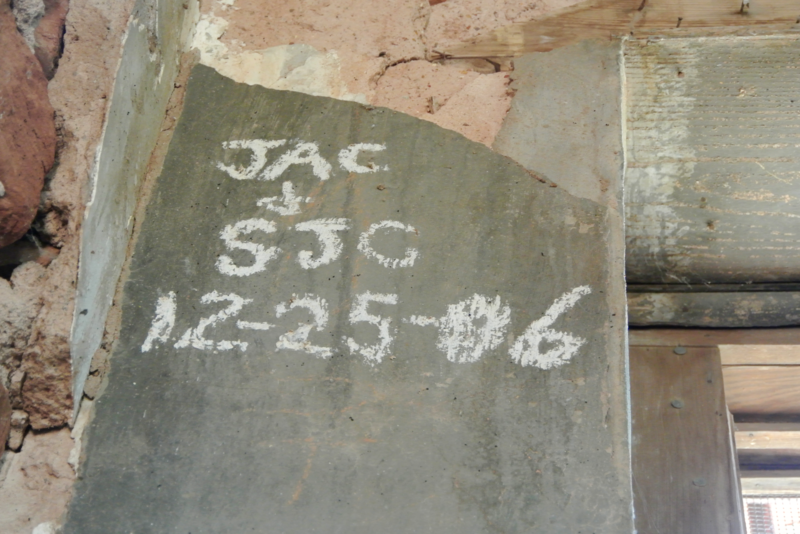 Inside, the walls are littered with decades worth of graffiti. The jail has been out of use since at least 1954, but I have a reckoning that its period of disuse goes back farther than that. The door has been open and free reign of the jail has been possible since at least 1986. 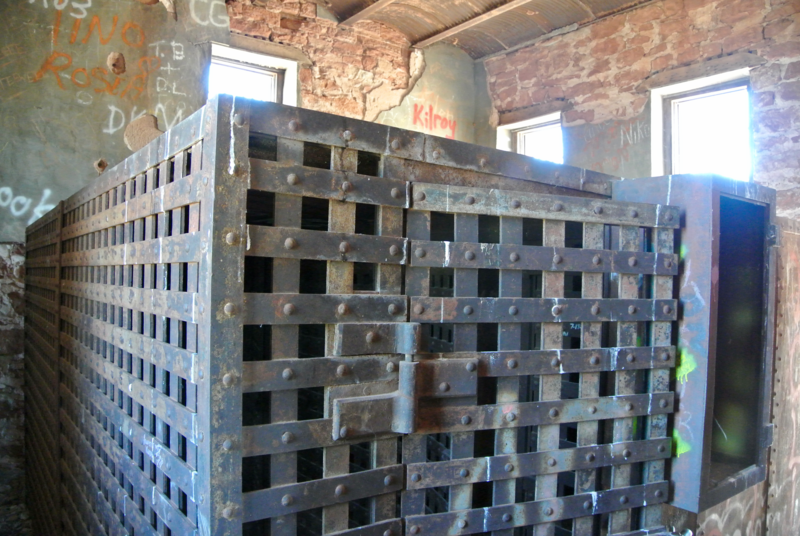 Inside the rock walls is one large, metal complex of cells. 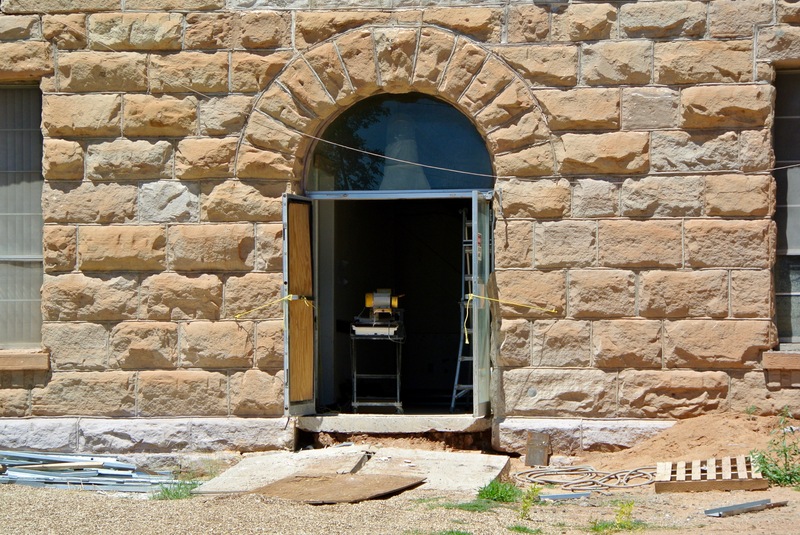 One online writer who has also been to Clairemont theorized that the jail itself may have been built around such a piece of machinery, rather than the other way around. The door to the cell block has been welded shut. 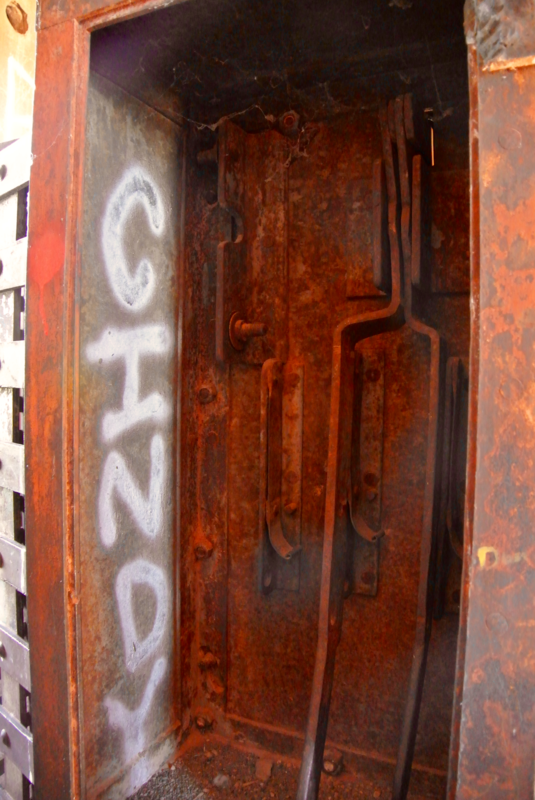 Along the western side of the “cage”, is a rusted panel with a single lever. 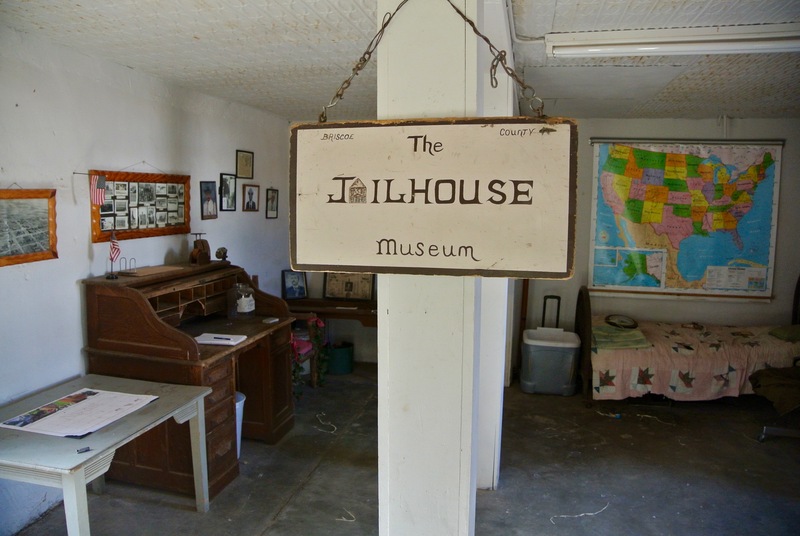 Since it was built in the mid-1890s, it is assumed that this jail may have been one of the very first in the country to employ such a lever system that jailers could use to single-handedly lock and unlock various cells at once. It doesn’t seem too scary right now, but back in the day, being locked up in something like that would have been enough for me not to become a highwayman. 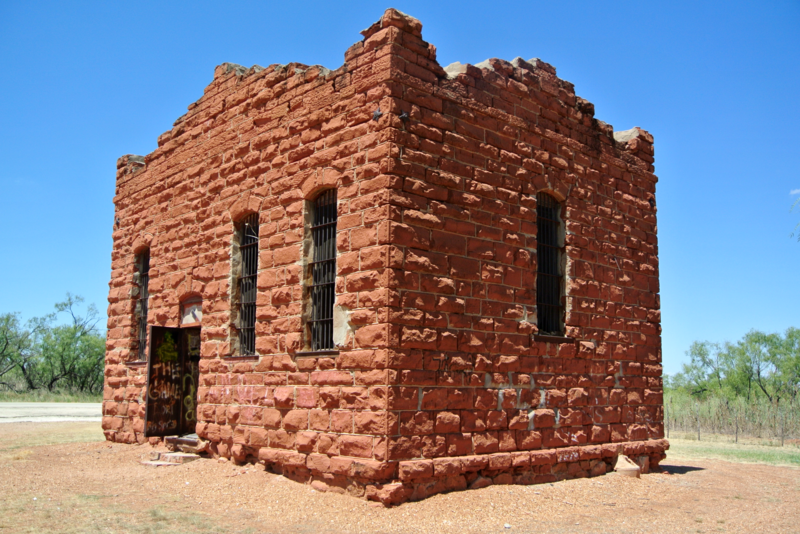 The plains around Clairemont were most likely rough and wild as far as crime was concerned, but I have a feeling justice was swift in the county seat. I had my photo taken in front of the jail, and then we drove back over to the courthouse for one there too. With that crossed off, we turned north at the blinking light and said our goodbyes to Clairemont. It was an interesting stop; one of the more interesting ones I can remember in recent memory. 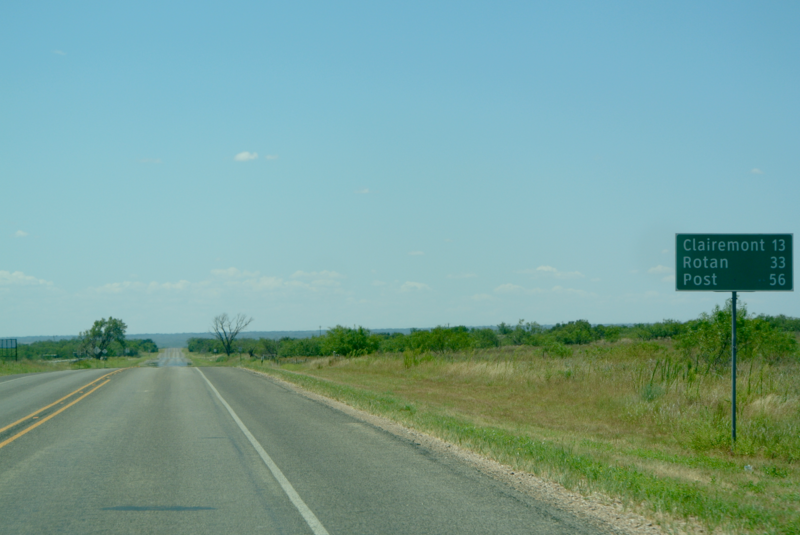 We were now speeding along State Highway 208, trekking north across more of those rugged plains towards Dickens County (the first new county of the day). By now, it was about 1:40, and we still hadn’t been anywhere we hadn’t been before. Even though I hadn’t realized it back in the day, I’d driven right through Clairemont for Jayton. So by any technical account, I had been there. 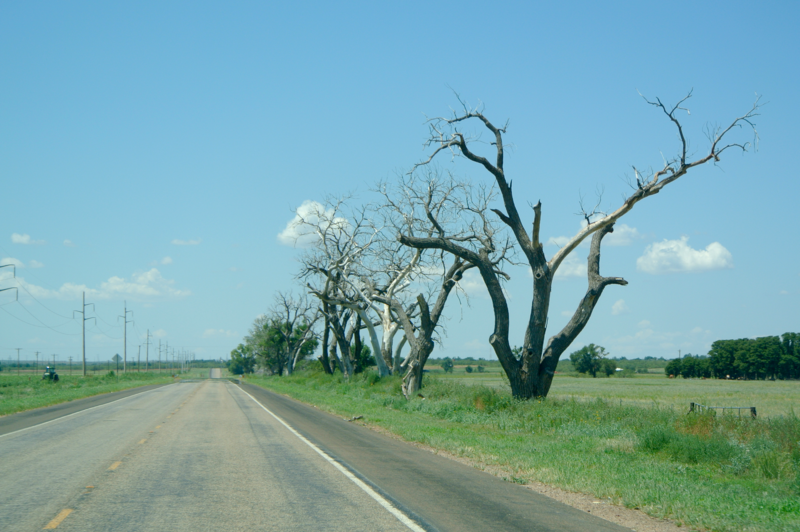 Dickens County, on the other hand, was something completely new. In no more than five minutes, we’d found ourselves excused from the ruggedness of Kent County, and faded back into some farmland. 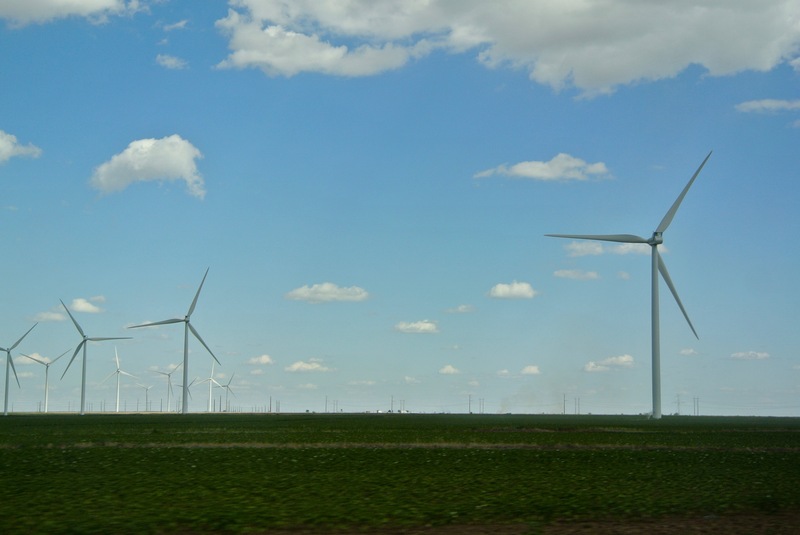 We were getting farther north now, and the switch to farmland wasn’t something too surprising. 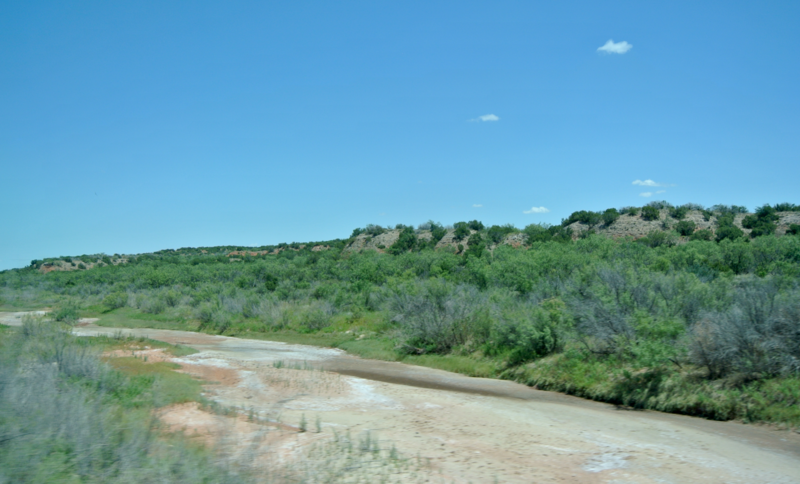 However, most of Dickens County lies below the flat mesa lands of the Llano Estacado. Flat farms lands come and go, but I suppose most of the rest of the area must look more like the rough edges around Clairemont. A little over halfway to Dickens (the county seat), we dead ended into State Highway 70, and turned left. The image above was when we were nearing the community of Spur. 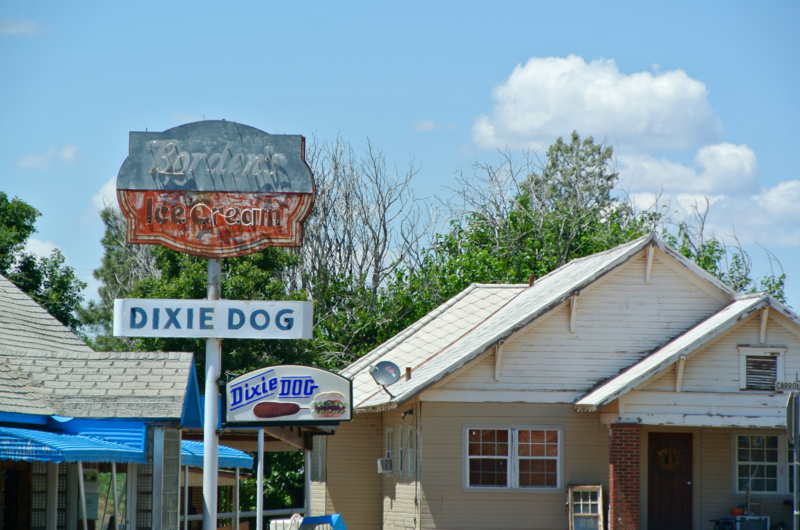 Spur is the largest city in Dickens County, but didn’t make the cut for county seat for one reason or another. Today, it remains the central shipping point in the county for cattle, wheat, and cotton. 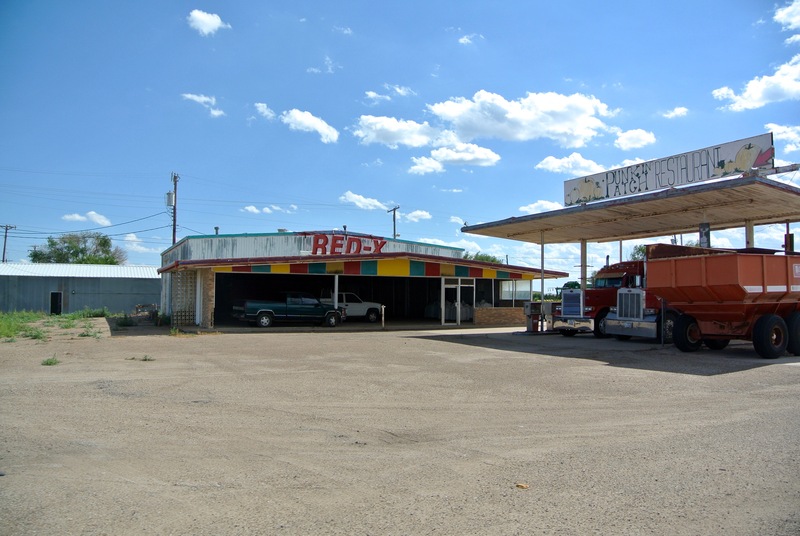 It has a small downtown district that by first glance, does look to still be thriving. We did a quick drive through it before continuing on to Dickens. Just off of the highway (and main thoroughfare through town) we spotted a memorial. This was built to commemorate Spur’s centennial in 2009, and it has a fitting home in Spur’s Dyess Park. That arrow on the left is the first of many we’d see this trip. Not until later would I realize what they stood for. They’re art sculptures constructed along the “Quanah Parker Trail”, marking important historic locations to the Comanche band led by Parker. 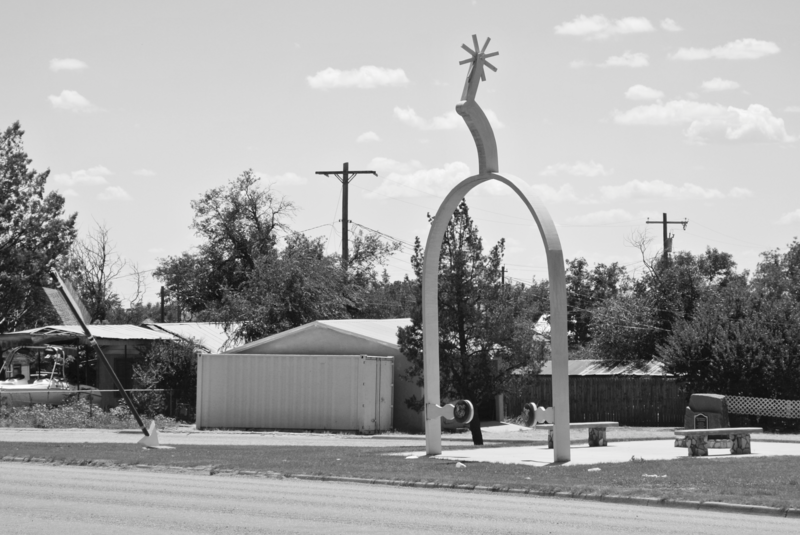 However, I’m not sure of the significance of Spur or the area around the town in Comanche history, as I didn’t get out of the car to read the plaque. Only stopping quickly to get a shot of the large spur, I got back in the car and we made north again. Here was our view leaving Spur for Dickens. As we neared Dickens, the distance once again adopted rugged hills. The time now was 2:15. In a matter of moments, we’d arrived in this little city on the high plains. 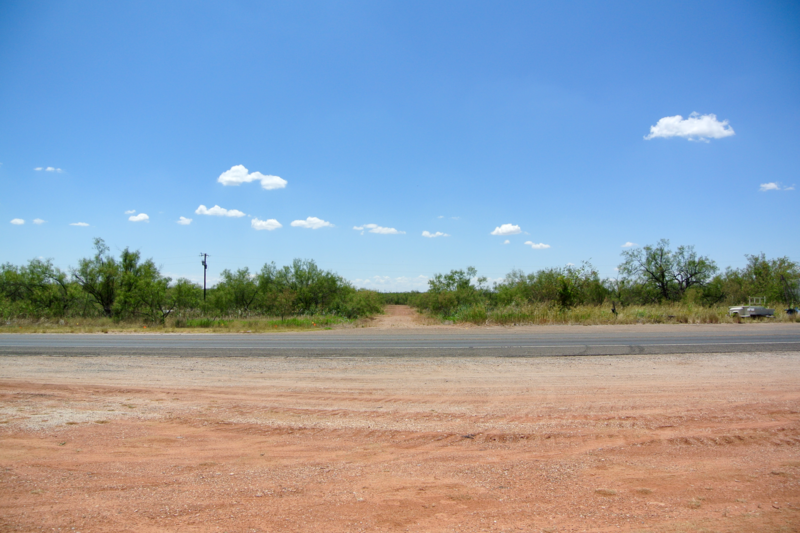 If you’re heading onward north to Matador, or west to Crosbyton, you can hang a left or head straight forward once you arrive in Dickens (without realizing that’s where you are). 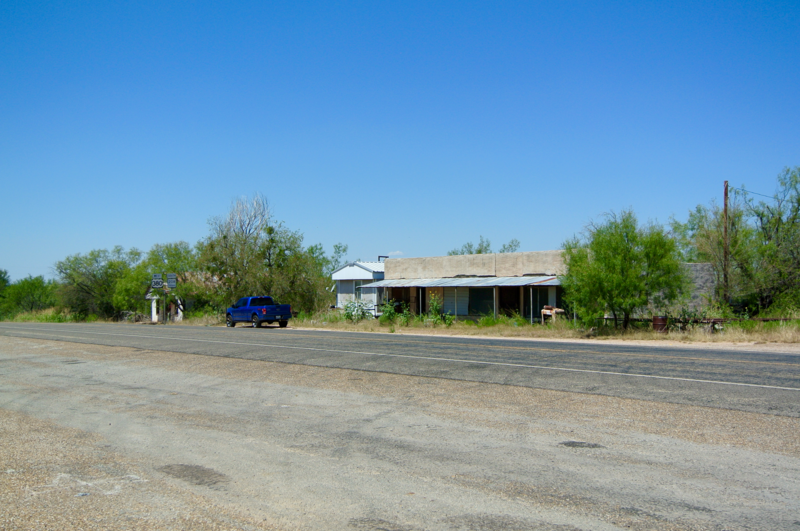 The intersection of the Matador-Spur road and the Crosbyton-Guthrie road is a mile or so beyond the downtown district of Dickens. We turned right towards the courthouse square before reaching this crossroads however, and navigated through some residential neighborhoods. When we emerged, we’d found our way to the first new county courthouse of the day. It was 2:19. We’d started the day around 9:30. Nearly five hours had gone by without achieving any new ground. It was a new record. 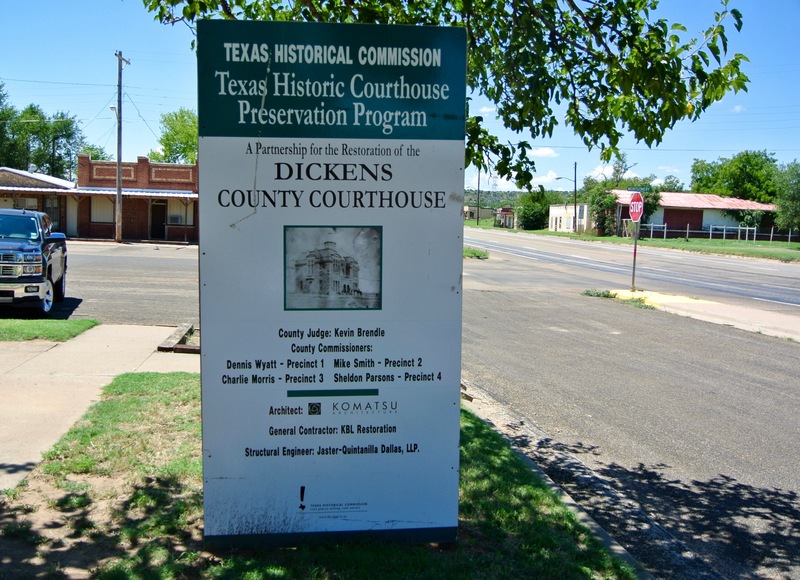 At long last, I’d reached the Dickens County courthouse. And to my surprise, and slight disappointment, I discovered that it was under renovation. However, you can’t really tell from this image. The front façade, or really any of the four, wasn’t particularly obstructed. In that sense, I was lucky. Over the course of this project, I’ve been fortunate when it comes to renovations. Most of the time I’ve either arrived just after the scaffolding’s been put away or just before the local contractors put it together. 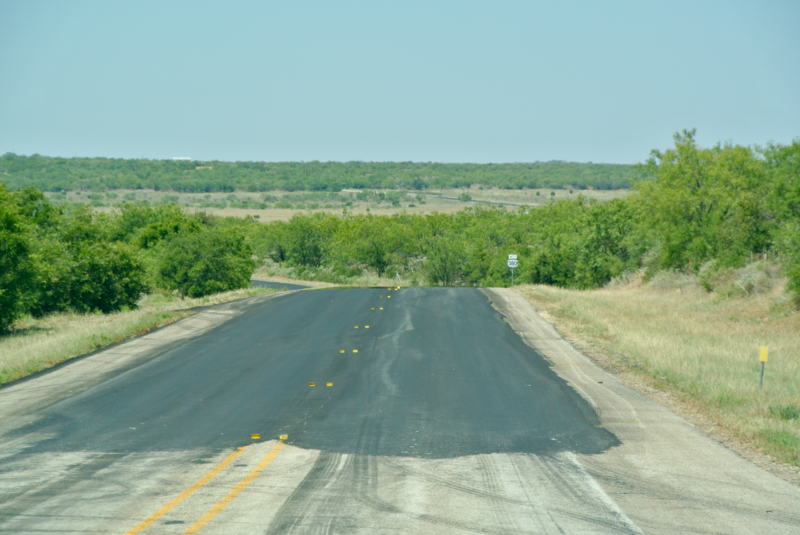 Only twice have I really been limited due to restoration projects: my first trip to Edwards County (where the entire courthouse was obscured), and Karnes County (same thing). Eventually, I made a return to Rocksprings to take post-restoration photos of its courthouse, but I don’t imagine I’ll ever go back to Karnes City. 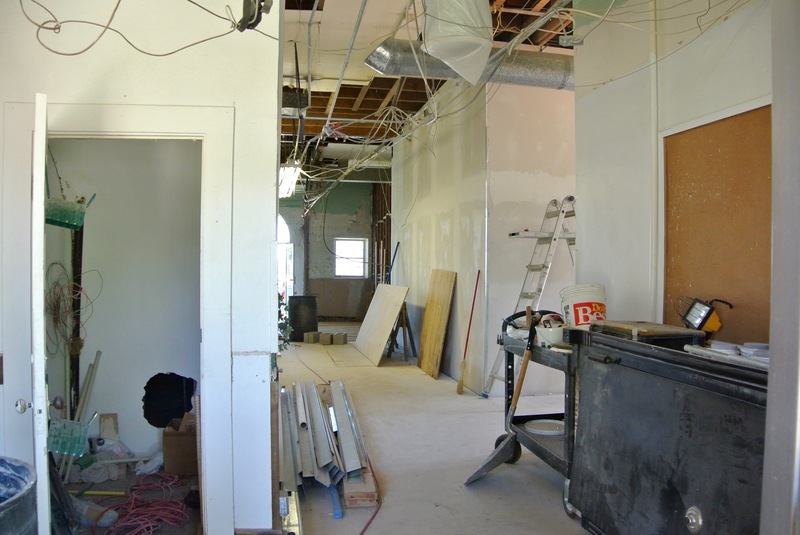 If you’re a follower of this blog, you might remember that the Karnes County courthouse was under renovation when I first arrived in 2012, and was still drowning in scaffolding when I came back in 2015. Ugh. As I said, I was lucky here in Dickens. 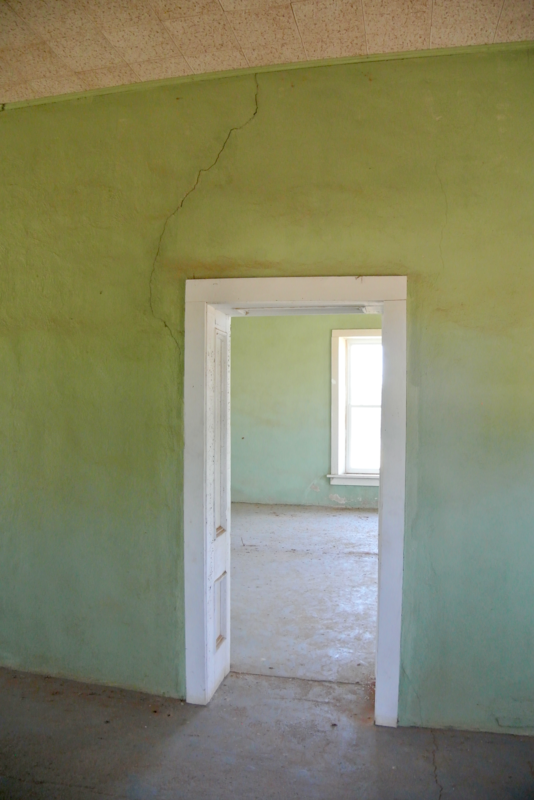 The most extensive of their restoration efforts was (at least for the time) in the interior of the building. There was a handful of contractors periodically walking in and out of it, and I could hear the sounds of power saws cutting through new beams as I made my way around the courthouse lawn. They were in the thick of it though. The interior of the courthouse was clogged with repair work. There’s no way they were holding any kind of court there at the time. I took this photo while looking into the front doors. My grandfather suggested we ask the workers if we could look around the building, but I said no. First off, I didn’t want any more problems with any more courthouse-related people after the experiences I’d had a month earlier. 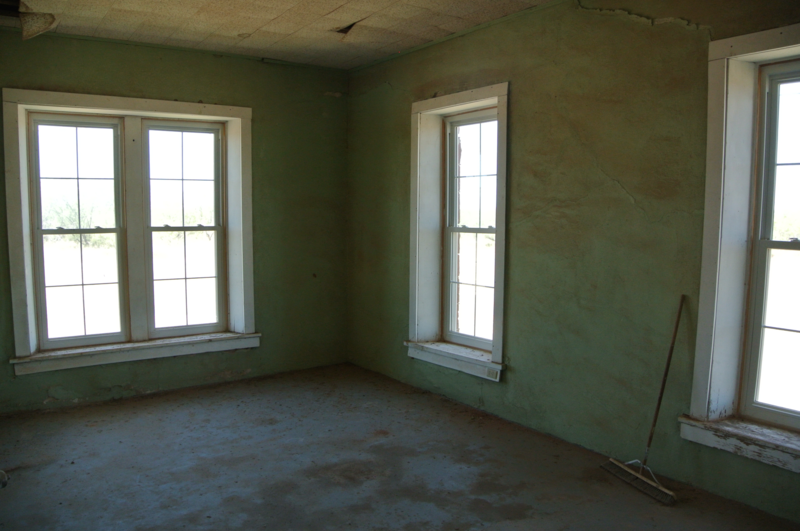 Secondly, we’d already been inside a mid-restoration courthouse two years back. There’s not a whole lot to see. I was more concerned with just being told “no”, when I wasn’t even hedging on seeing the interior. I just didn’t need to get involved. The Dickens County courthouse is certainly historic, but I don’t expect it had anything close to resembling the original courtroom form 1890. Hopefully, after this restoration it will, but I’ll have to be passing back through Dickens someday to take advantage of that. Regrettably, I don’t imagine that’s going to happen any time soon. On the southern side of the building were the collective efforts of such a restoration project. Unlike other communities I’ve been to, where reflective, orange partitioning has to be put up to keep people off the work zone, Dickens required none. This square doesn’t see as much action as some of its contemporaries farther to the metropolitan south. No, the piles of debris were there for any one to approach. You don’t think they’d miss one little rock, do you? 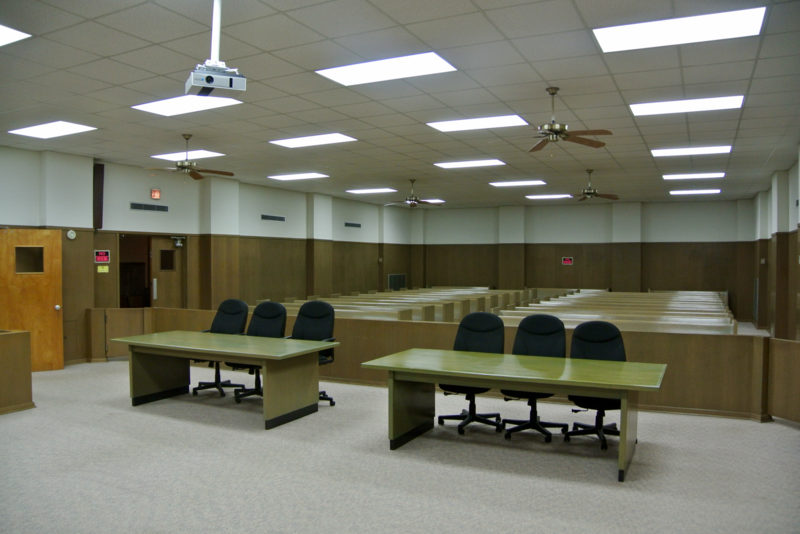 But the photo here is what the courthouse originally looked like. Hopefully, there will be some effort to get the roof looking like it once did (and maybe that courtroom I missed will look more like its 1890 version). Worn rocks, boarded up entrances, plastic sheets and air conditioning hanging from windows, and a literal cement slab for a roof. It’s my sincerest hope that the Dickens County Courthouse’s best days are ahead. In the meantime, I had more things to see. 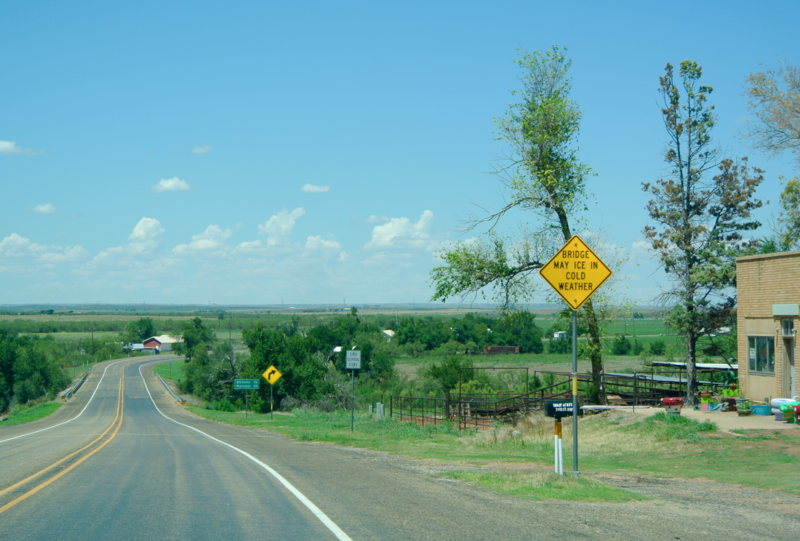 Dickens County was the first (and last) stop on this trip not on the Llano Estacado. Which, after some post-trip thought, I realized was my final county to ever visit not on the massive plateau. The twelve other counties on this trip lie several hundred feet higher than Dickens does. 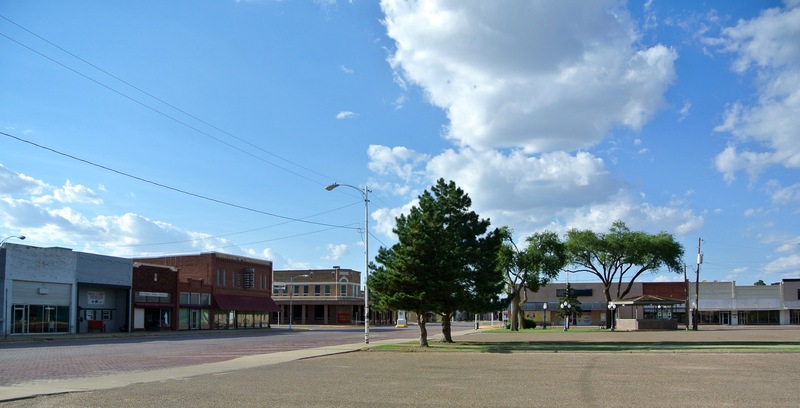 If one was able to move a city like Crosbyton and Dickens next to one another, Crosbyton and all of its buildings and streets would be approximately 476 feet higher. I just find the whole notion of elevation fascinating. You don’t realize it while you’re there, but in some cities you can be thousands of feet higher than others. Entire cities basically in the sky above others. In Dickens, with an average elevation of 2,546 feet, you’re 2,549 feet higher than the city of Galveston (minus the height of its buildings). Dickens is 1,263 feet higher than the Empire State Building. If the two were put side by side, the little Dickens County Courthouse would still be higher in the sky than the might of New York’s most famous skyscraper. I just find that interesting. Ah, but I’m digressing yet again. You’ll have to forgive me on this blog post. There’s a lot to be said. It’s my last trip after all. Soon, we headed west on Highway 82 and made our way to the beginnings of that famous plateau. 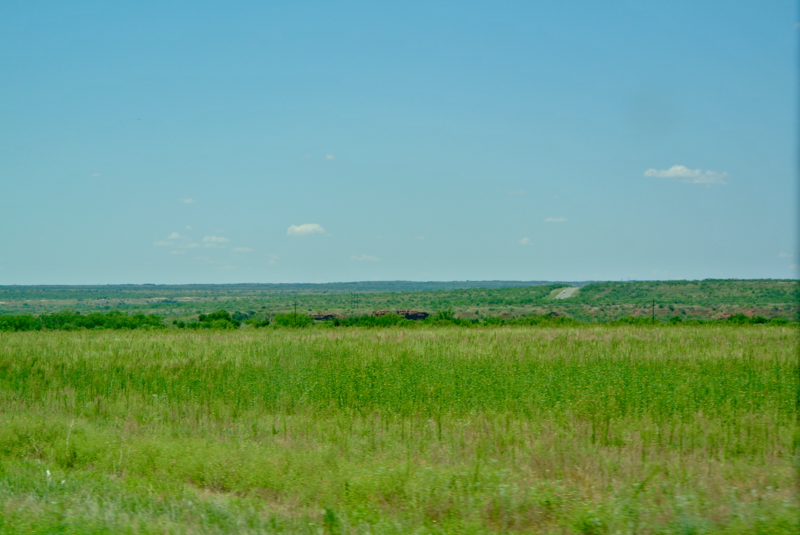 This was our view not long after leaving Dickens, and you can see the faintest traces of the Llano Estacado on the horizon. I want to demonstrate exactly what it is I’m talking about. For locals of this area, I’m sure the Llano is no big deal. 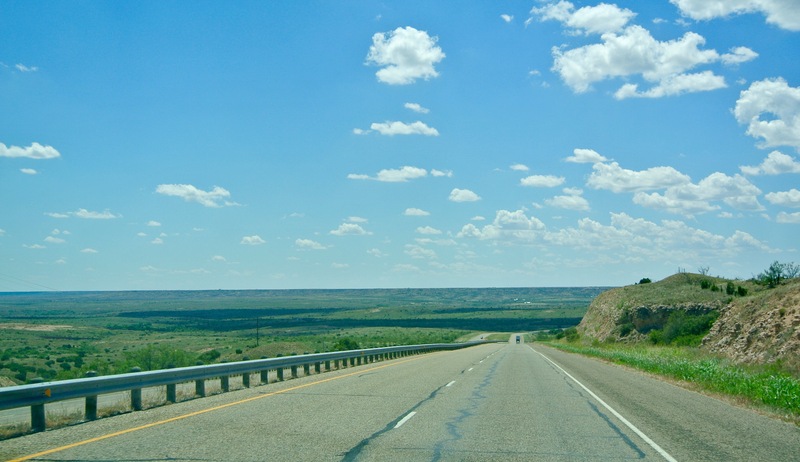 But for me, it’s nearly mind boggling to think about the wild, rugged terrain of this part of West Texas suddenly falling away. It’s true. Once you trek up to the top of the plateau, everything behind you just fades away, and you wade into a very ethereal land of flat farmland. It’s as if you’re surrounded by harsh noise in the valley below, but once you make it to the top, there’s immediately complete silence. At least, that’s how I see it. This is a satellite image I nabbed from Google. On the left, you can see Crosbyton, and on the right Dickens. The rugged looking gray color starting in the top left and winding down to the bottom and middle is the cliffs of the plateau, where they merge with the rest of Texas. As you can see, Dickens is down “in the valley”. Crosbyton, meanwhile, is that “shining city on a hill”. 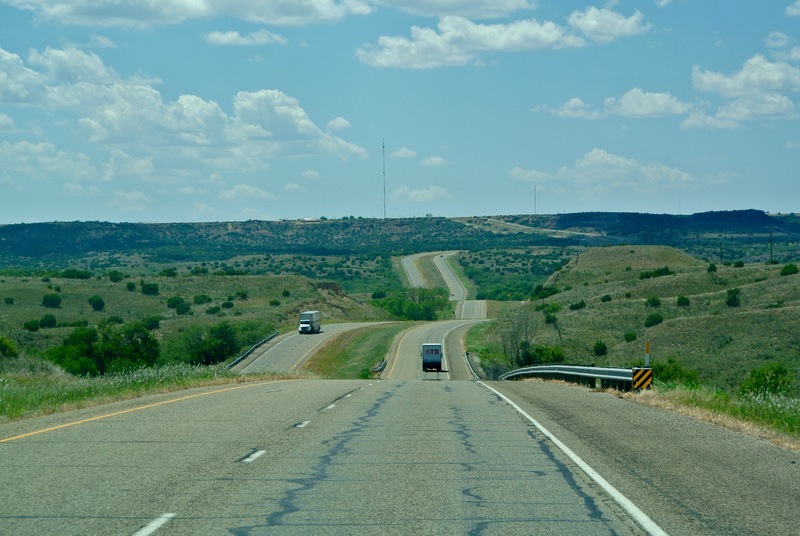 This is the view as we began the journey up the Llano Estacado (this was far more smooth a transition than the one I saw between Borden and Dawson Counties the summer before). And suddenly, here we were. That’s a farm on my right, and even a forest of wind turbines out there in the distance. The change is swift and remarkable. Maybe you can tell it from the Google Maps photo above, but Highway 82 to Crosbyton rises up from the valley onto the plateau, and then falls down again before rejoining it a few miles later. 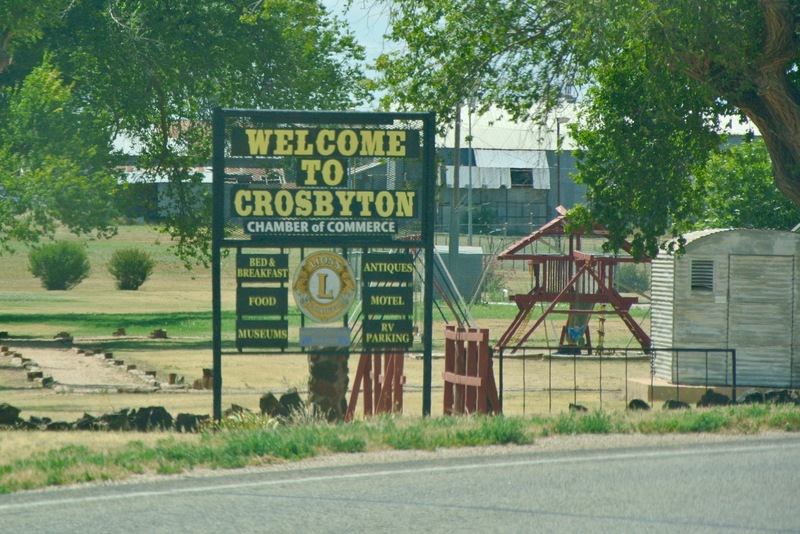 But once we made it back up, we arrived promptly in Crosbyton (which lies fairly close to the edge). 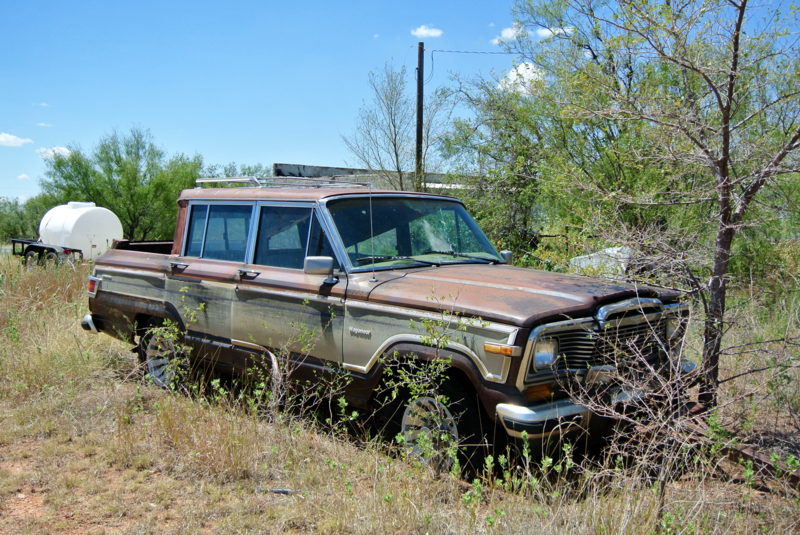 Aside from spotting another one of the Quanah Parker Trail arrows (still didn’t see what it was marking), our journey into downtown Crosbyton wasn’t entirely eventful. Soon, we had arrived at the courthouse. 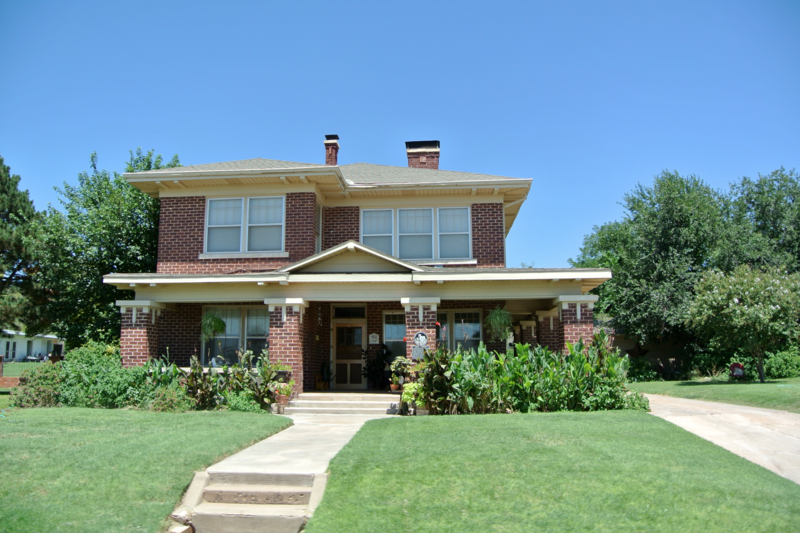 Fort Worth architect M.H. Waller did this one in 1914. 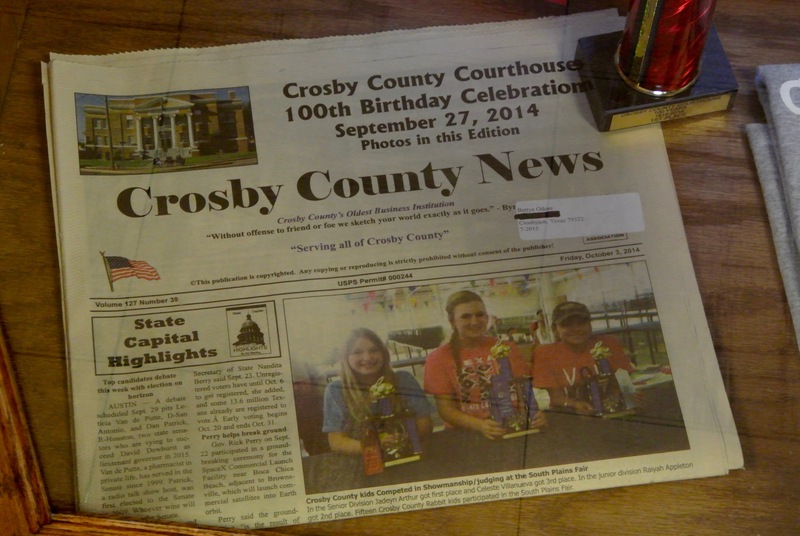 It was the third courthouse for Crosby County, but the first in Crosbyton. 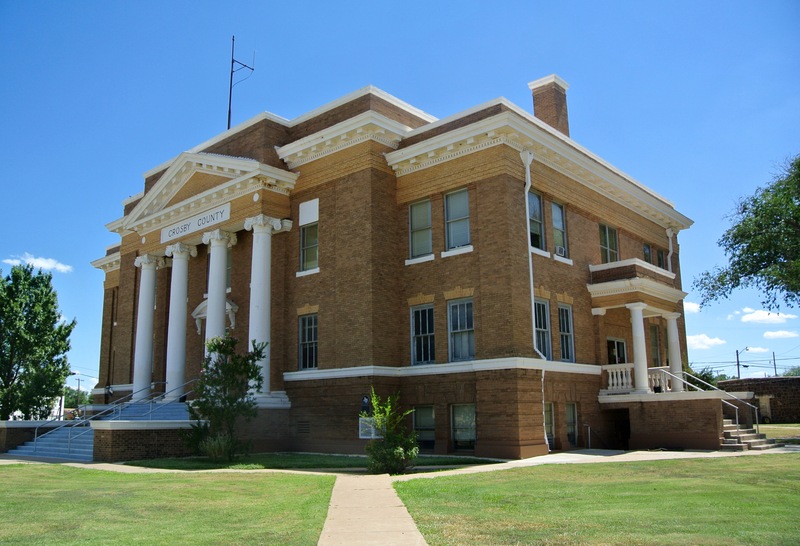 The original county seat, Estacado (properly named) was founded by a group of Quakers in 1879. The first courthouse served that community. Then, in 1890, the county seat moved to Emma (nine miles west of Crosbyton). A second courthouse operated there for twenty years. 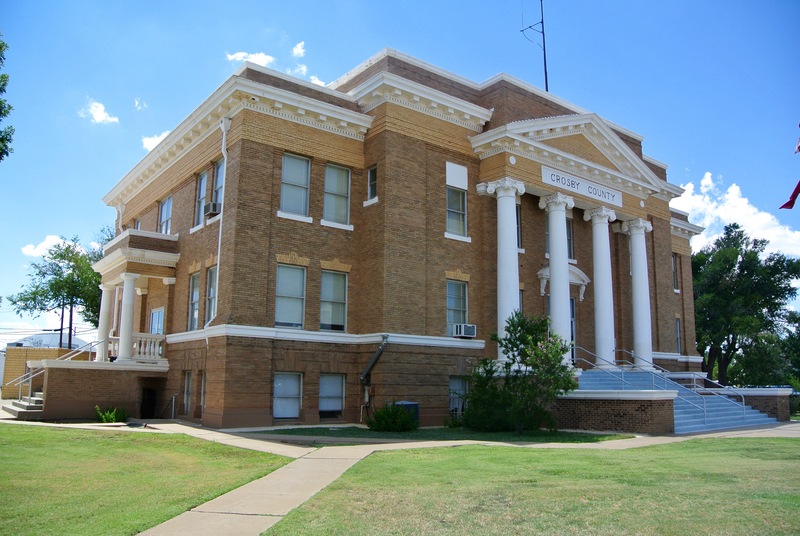 When at last county government relocated to Crosbyton in 1910, the land for this courthouse was donated by a town founder named Julian Bassett. 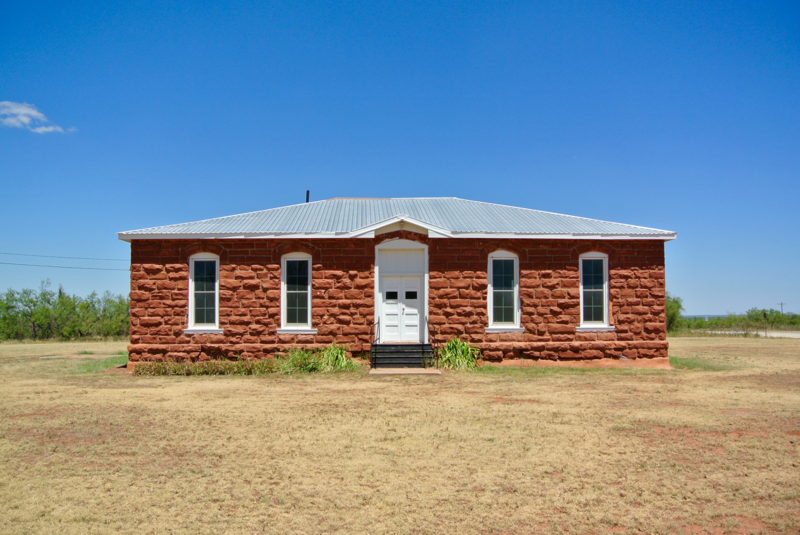 Court was held in a schoolhouse for four years until this building could be constructed. 1914-2014. Two years before I got to the courthouse, it celebrated its 100th birthday. Apparently, part of the festivities included reenacting a locally significant shooting that occurred on the courthouse’s front steps in 1923. I found that interesting. And here I was thinking I might just be able to avoid any confrontation on this trip. 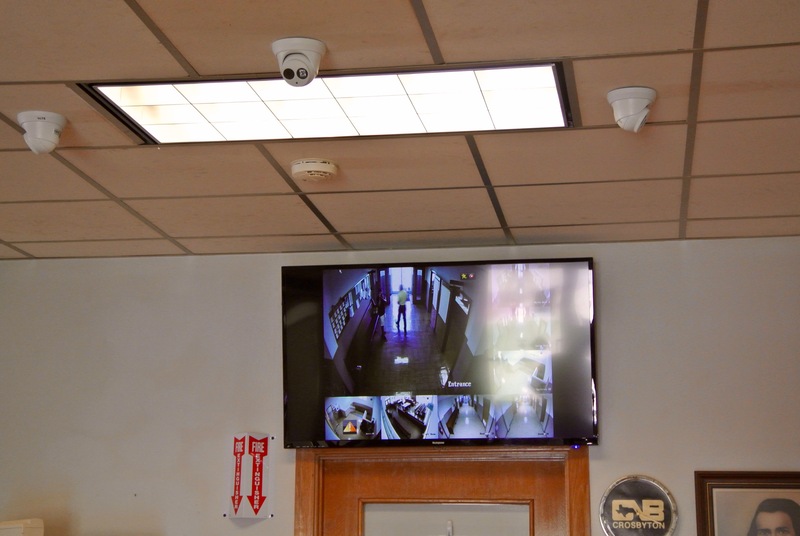 No one came and talked to me, but after seeing these cameras, I was wary. 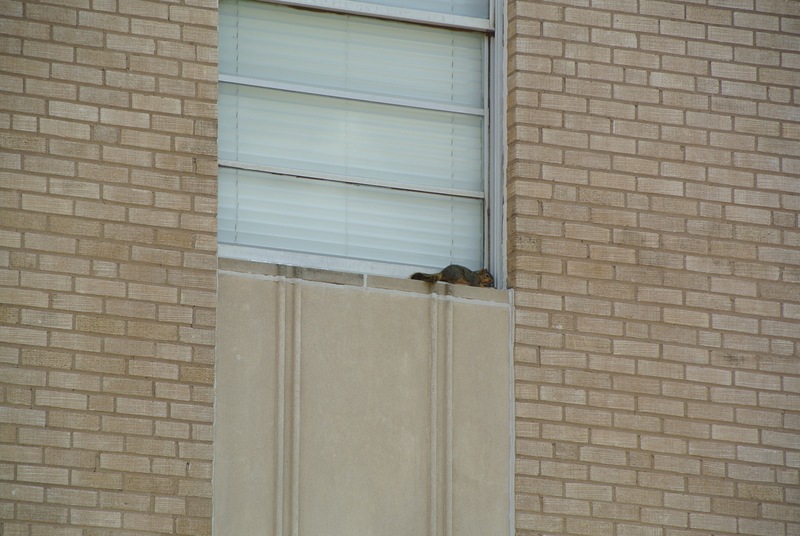 As I continued photographing both the exterior and interior of the courthouse, I kept my eyes open for anyone. I got a couple of a looks from courthouse patrons as they pulled away from the parking lot, and passed by a local police officer as well. He said nothing, but I tried to be as nonchalant as possible. The good people of the Panhandle afforded me no issues, not in Crosby County anyway. And so we were off. 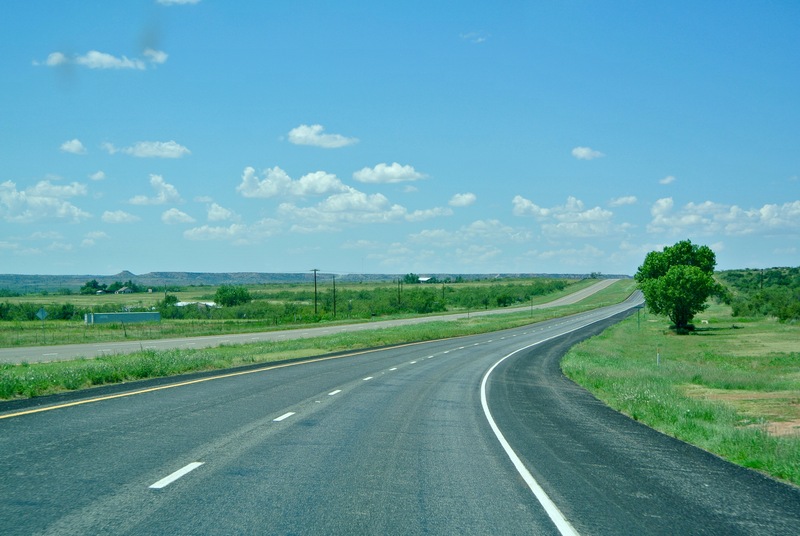 The road west of Crosbyton finds its way to Lubbock, and while that city was on our list, we weren’t headed there just yet. Our route took us north, to Floyd County. There is a route connecting Crosbyton and the Floyd County seat, but it’s two or three small county roads. 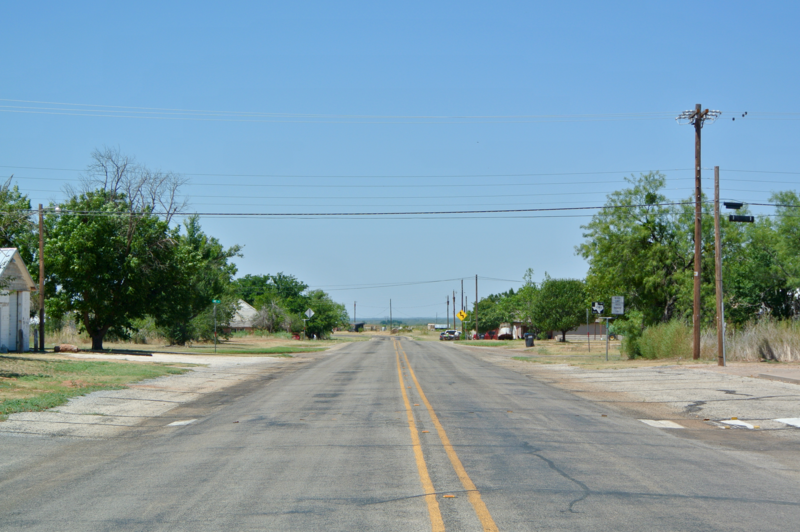 Highway 62 down from Floydada, instead, intersects in Ralls (about nine miles west of Crosbyton). I wonder if that’s where Emma was (or if Emma became Ralls). I’ll do some research. 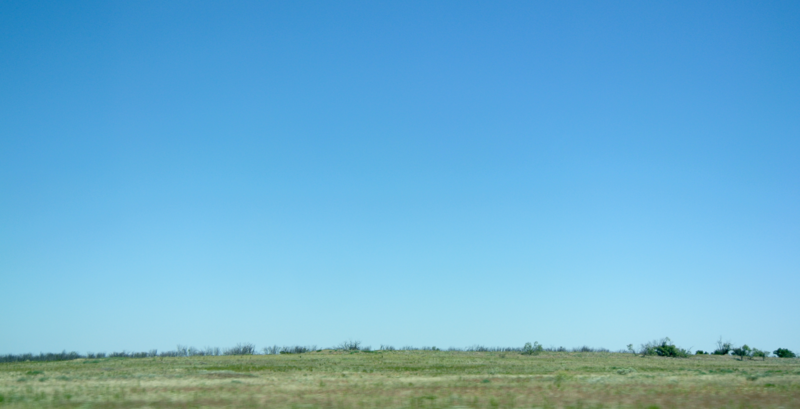 For some reason or another, I didn’t take any photos in Ralls. All I can tell you about it is that I know country singer Billy Walker was born there. However, from what I saw in Ralls, there doesn’t seem to be any widespread public knowledge of that fact (no roads/parks/etc. named or anything). 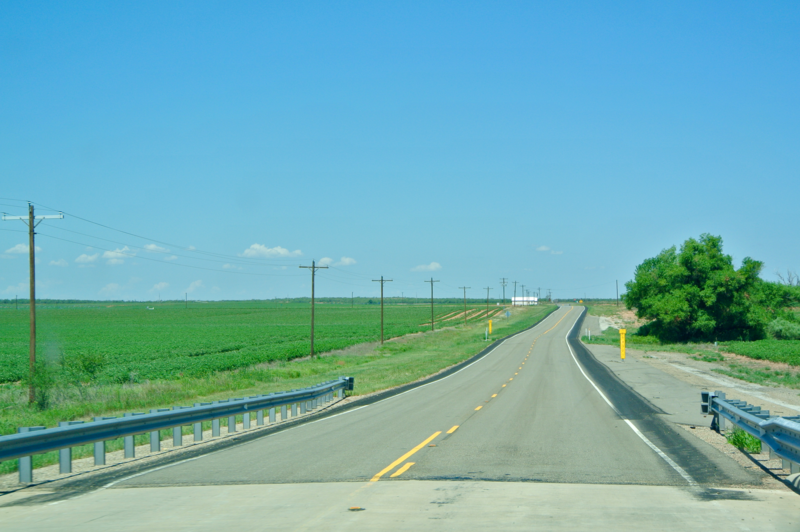 At Ralls, we turned north on Highway 62 towards Floydada.In a matter of minutes, we’d come to Floyd County. I have to admit, this region’s county/county seat pairings aren’t too diverse in name. Dickens County/Dickens, Crosby County/Crosbyton, Floyd County/Floydada, Lubbock County/Lubbock. I really don’t know what that’s about. There’s a brief interruption in the Llano Estacado between Ralls and Floydada, which you can see here. It lasts very quickly, though, before you’re back on the plateau and heading along your merry way. 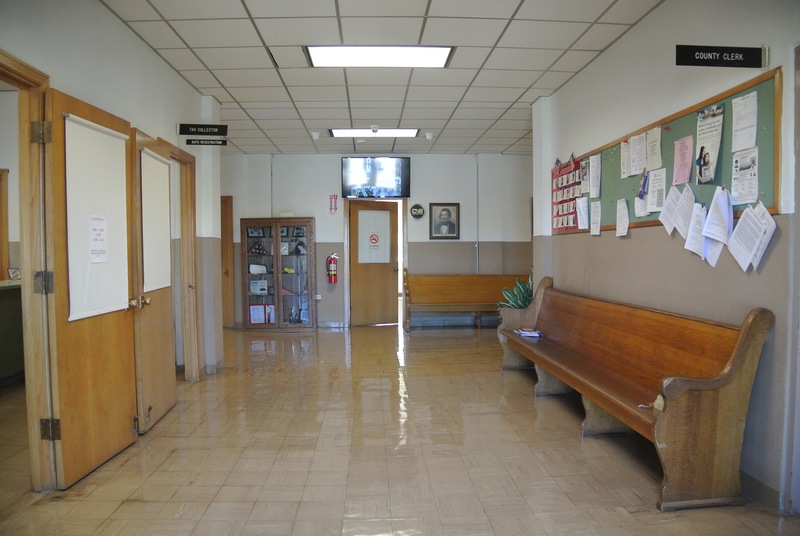 Once in Floydada, it took us a minute or two to find the courthouse. It’s back to the east from where the road from Ralls emerges into the city. Getting there gave us a little time to explore the city. Yes, a museum devoted to the famous Floydada Terrier. I mean—Boston Terrier. So what’s this doing in Floydada, Texas of all places on Earth? I was seriously confused until I looked into it a bit. Turns out that a local man named Bob Hambright (who has been collecting Boston Terrier-related toys and tchotchkes since 1991) eventually decided to put his collection on display in 2007. Apparently, this building was actually a hospital until 1960. After that point, it became a pharmacy and then a video rental store. After the advent of Netflix and the virtual demolition of that industry, it sat empty for about six years. 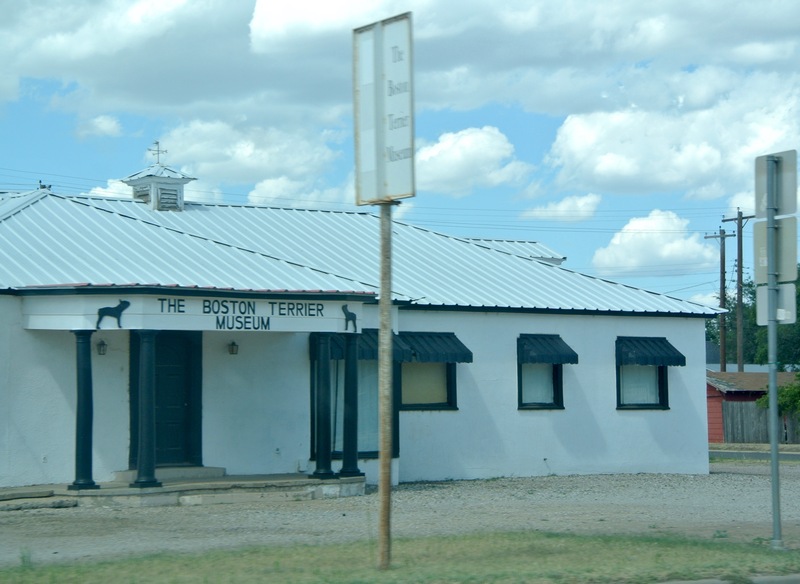 Now, it’s Floydada’s own Boston Terrier Museum. Who knew? That’s the part of Texas I really love. Meanwhile, we were arriving at the Floydada square. 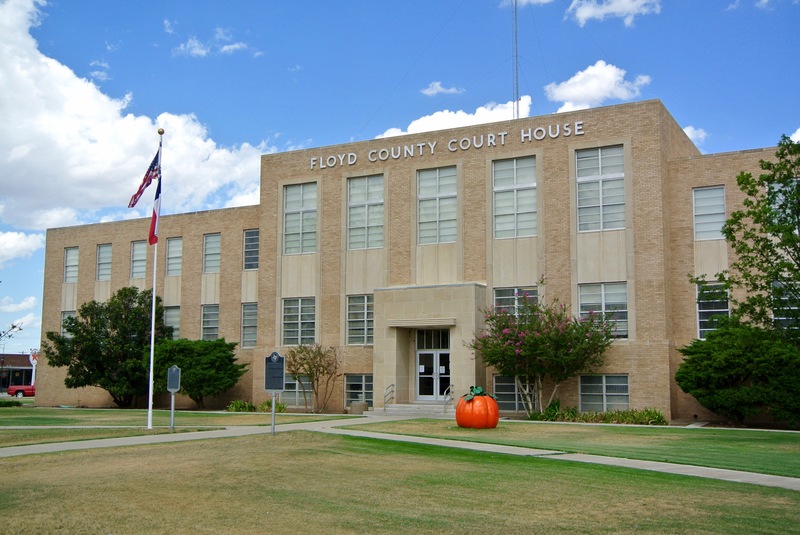 The Floyd County Courthouse comes to us from the year 1950 and was designed by architect Martin Stiles. It took the place of a large 1911 design that shared rank with Franklin, Mason, and Jeff Davis Counties. An unfortunate loss, to be sure, but this courthouse if far from hard to look at. Still, it’s got that same old modern courthouse smell to its interior, and it exudes the same feeling one gets when entering a building of that era. The county’s manicured lawn and well maintained exterior were very nice to observe. It sits in a region where other constructions of the same time period have simply festered over the years, with what appears to be no real care shown towards them. Upon arrival here, I discovered that (previously unbeknownst to me) Floyd County is a major area of pumpkin production. Boston Terriers and pumpkins…oh, and Don Williams too. What a place Floydada is. 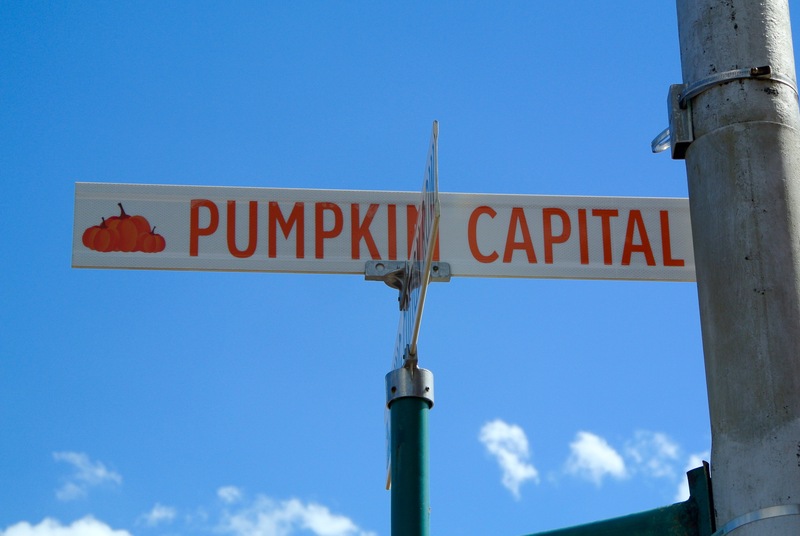 The courthouse literally sits on Pumpkin Capital Lane. I promise it wasn’t October when I visited the courthouse. Even in the heat of August, Floyd County keeps its signature crop on display. 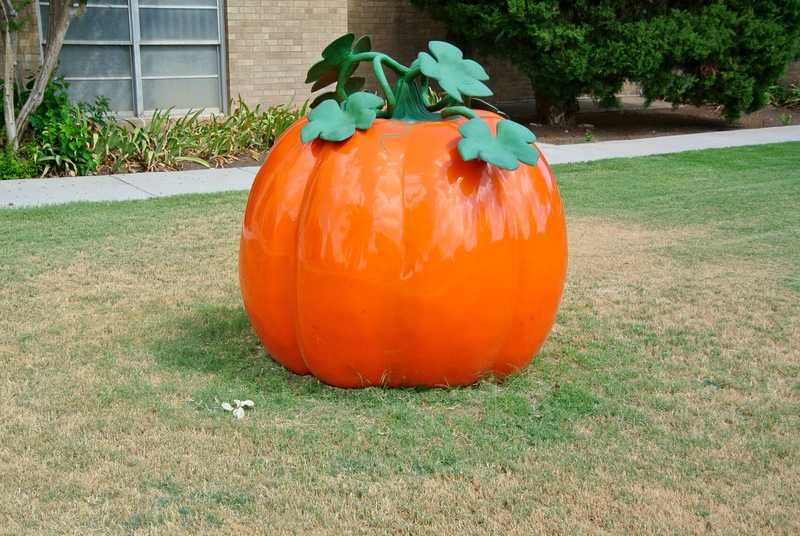 And the courthouse wasn’t the only place in town giving a nod to the area’s heritage of pumpkin growers. 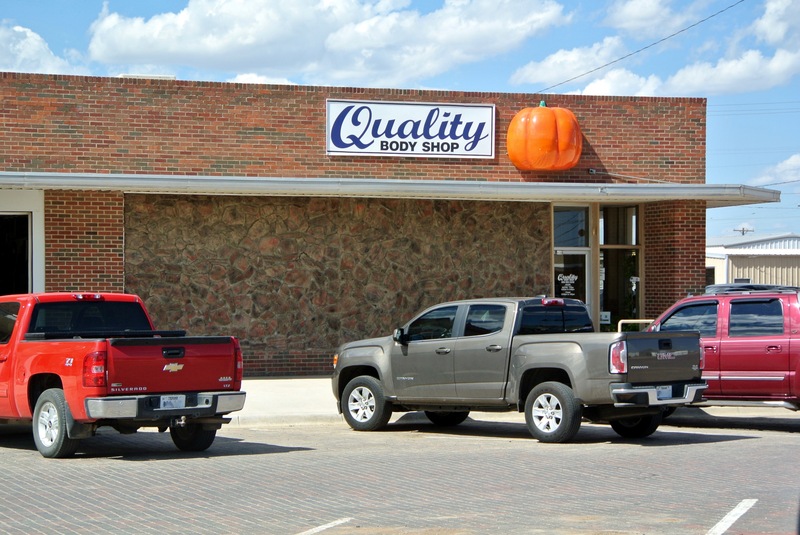 This body shop, on the square, had half a pumpkin “growing” from its wall. The “Punkin Patch Restaurant” is here too, though it looks like it hasn’t been visited in a while. Instead, we ate at the local Dairy Queen. By this point in the day I was starving (I’d had a protein shake to tide me over for the morning, but by now it was around 4:00). It was time to eat, and admittedly, Floydada didn’t have too many selections that we could find. If there’s some fine place to eat there that we missed, I’m regretful. However, I have to say, that Dairy Queen was probably the best one I’ve ever had. Maybe it was the hunger talking, but it really was the best meal I’d ever had at one of their establishments. It was the third time we’d resorted to the “Texas Stop Sign” during one of these trips. It was dinner in New Boston two years ago and lunch in Crane last year. This was the best of the three stops. We ate after finishing up with the courthouse, and business at the Floydada branch was fairly slow this time of day. The young window worker had a bit of a hard time getting the order correct, but her supervisor eventually came over and sent us on our way. We ate in the car, because there was a fair bit of ground left to be covered before the sun came down. 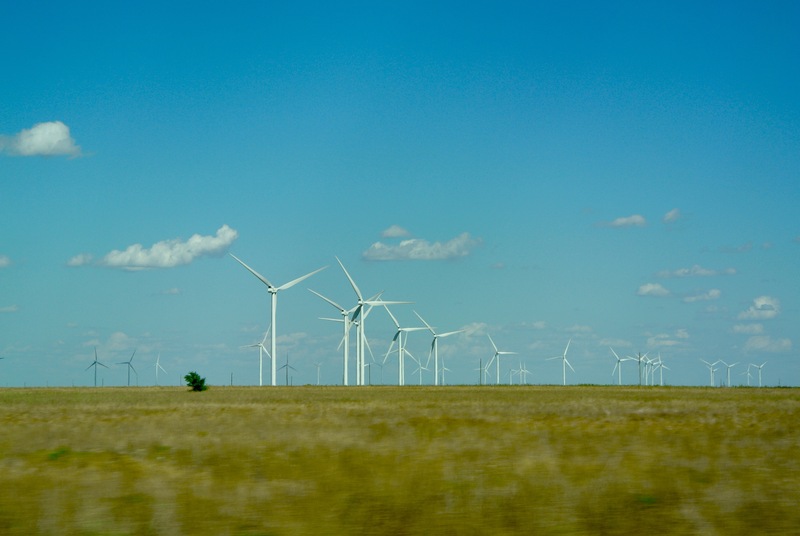 The road took us north even still, bound through a stretch of land dominated by wind turbines for Briscoe County. There’s Silverton in the distance. 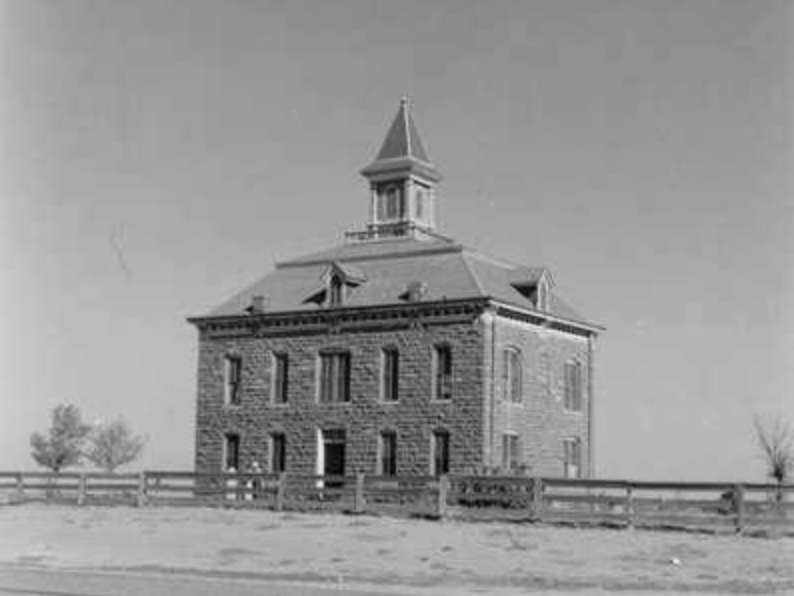 The courthouse is just off Highway 86, which we hooked a right on once inside the city. In little towns like this, most of the courthouses are just off the road to the point where one side of the “square” is actually the highway. I’ve found that makes things in these sleepy cities seem even sleepier. Where I’m concerned, that’s a term of endearment, by the way. At least when I arrived, there wasn’t a whole lot of traffic down the highway. 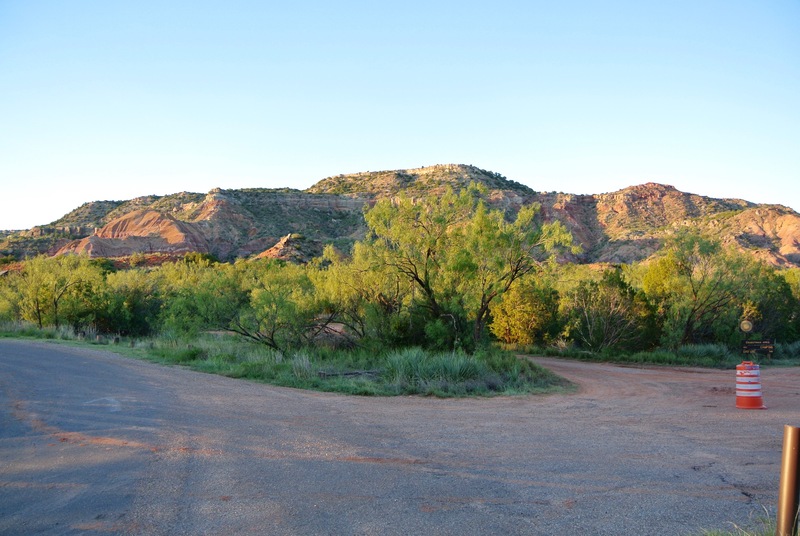 Not many people were out and about, and the silence of Silverton (except when punctuated by the occasional car) was just typical Texas. 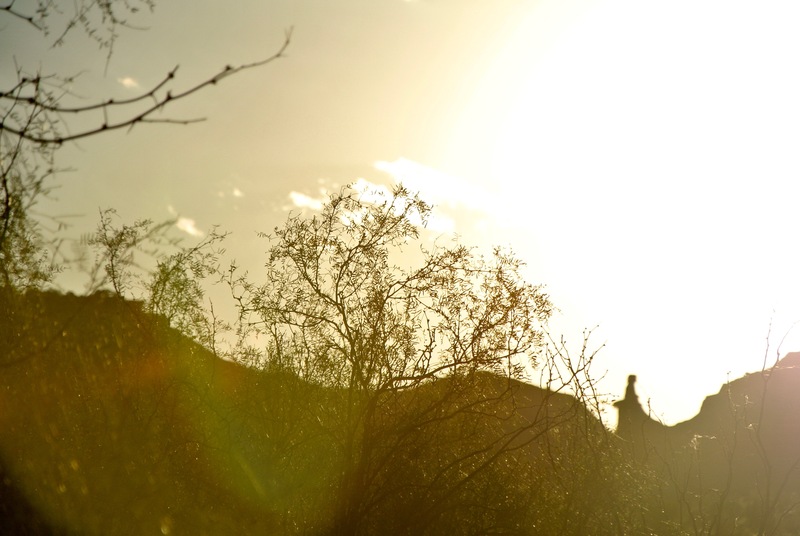 It’s that signature sound of a small, Panhandle town: silence. Some part of my soul really loves it. And when there’s no cars zooming by, there’s the soft hoots of lonesome doves. 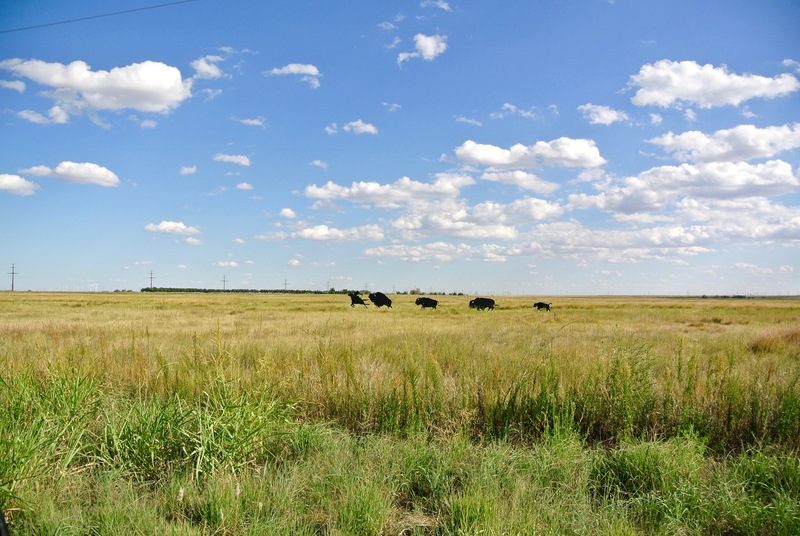 That’s the sound of the open plains, where freedom and independence meet in far North Texas. To me, there’s no other place like it. The courthouse was built in 1922 by architects Smith & Townes in the Classical Revival style. You can tell that by the Doric columns boosting up both main façades. Those classic elements date back to the Ancient Greek tradition. I have to admit, after all these years of this project, I only recently had the realization at why “Classical Revival” was called Classical Revival. Revival of the architecture of the classics. It’s not hard to grasp. I’m not sure why it took me so long to figure that one out. On the square, there was a policeman waiting in his car. I don’t think he was watching us, but my grandfather went over and talked with him all the same. Again, I wasn’t looking for trouble. 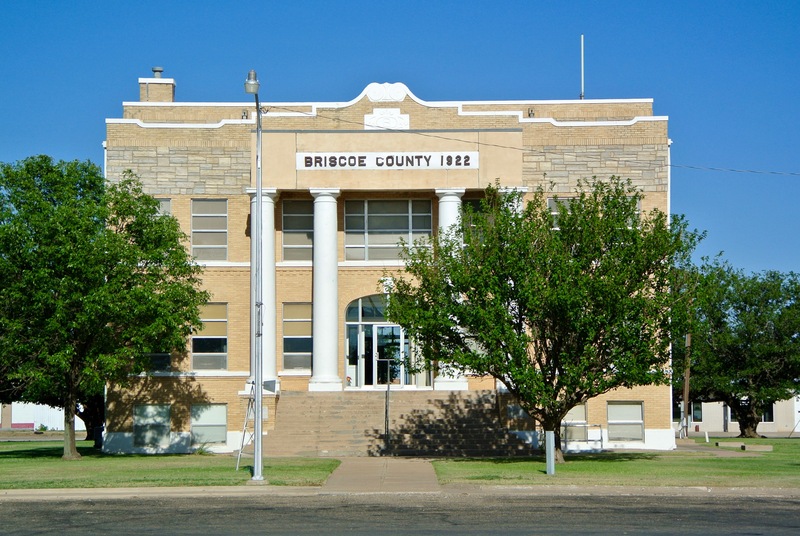 Any trouble caused back in the day and I would have landed here: the Briscoe County Jail. It dates from 1892, and I understand that it is the oldest building in the entire county. I would have hated to have been locked up in this thing, but a part of me thinks that the Kent County Jail would have been ten times worse. The Briscoe County Attorney is said to be the normal keeper-of-the-keys, but the courthouse had just closed when I arrived in Silverton. Regardless, the front door of the jail was open. Today, it serves as a museum. Naturally, I had a look around. This was a historic photo on display, taken sometime after 1922. It’s truly an amazing shot, especially considering there probably weren’t too many airplanes buzzing around Silverton back then. 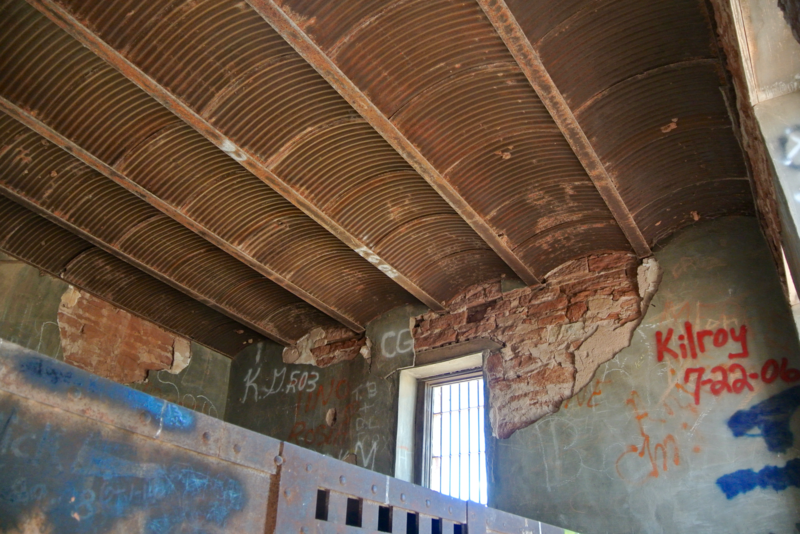 There was a small, rickety staircase that led to the second floor, where the old cells were. I briefly took a couple photos of them, but I’ll leave those for the Briscoe County page. After maybe fifteen more minutes, when I’d finished photographing the courthouse and its grounds, we got back in the car and set off down the road. 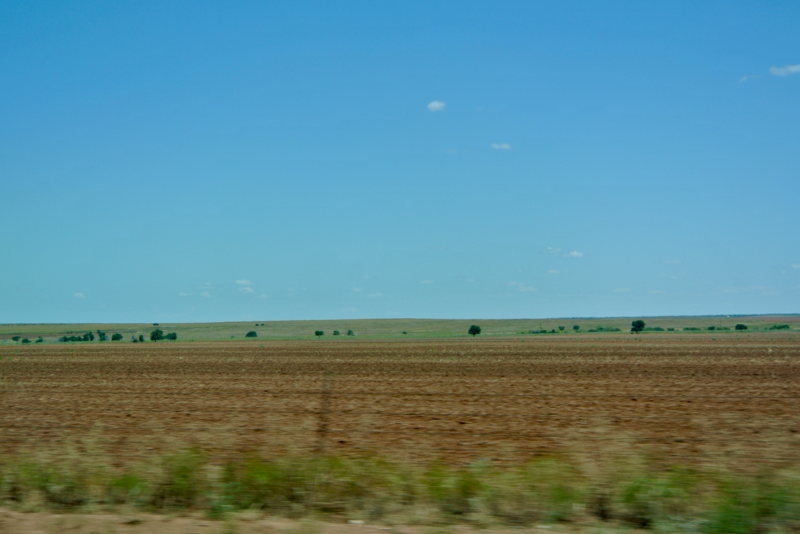 Just beyond Silverton we entered the thick of the Staked Plain (Llano Estacado, in Spanish), immersed once more by a boundless, flat expanse of farmland. We encountered, like in the photo above, our fair share of cattle. But not far at all from the outskirts of town, I spied something that didn’t look exactly like cows. We had to turn the car around to get a better look. 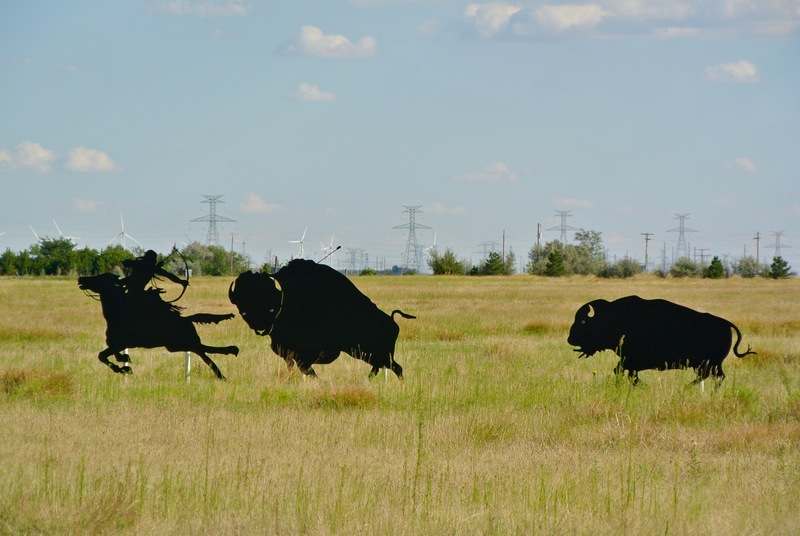 It’s a small herd of buffalo, and what looks like a Comanche hunter alongside them. Not long after the buffalo we crossed the line into Swisher County. 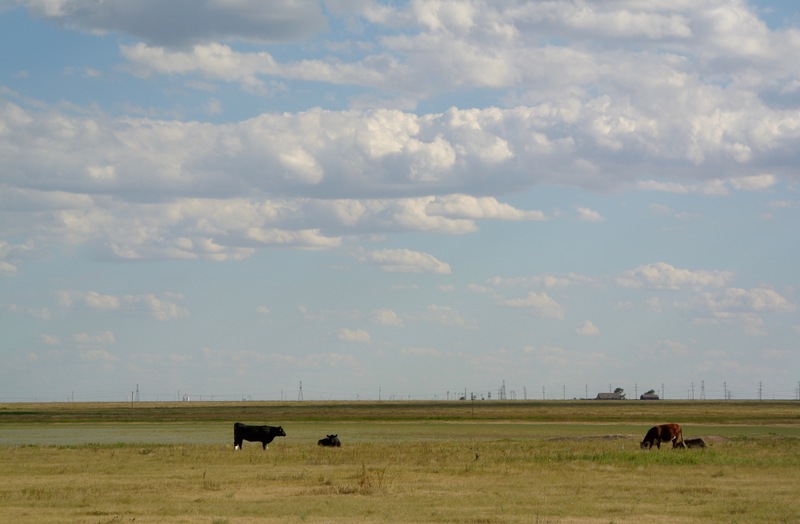 The land south of the highway is flatter (as you can see from the buffalo photos), where wind turbines still sprout up in the distance towards Floydada, but to the north of the highway things begin to look a bit more rugged. 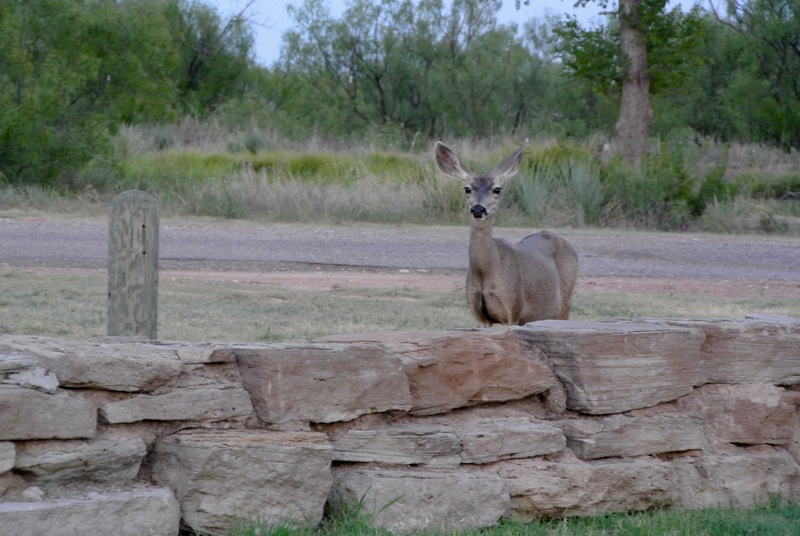 That’s likely because this land borders the work of the Prairie Dog Town Fork of the Red River: Caprock Canyons. 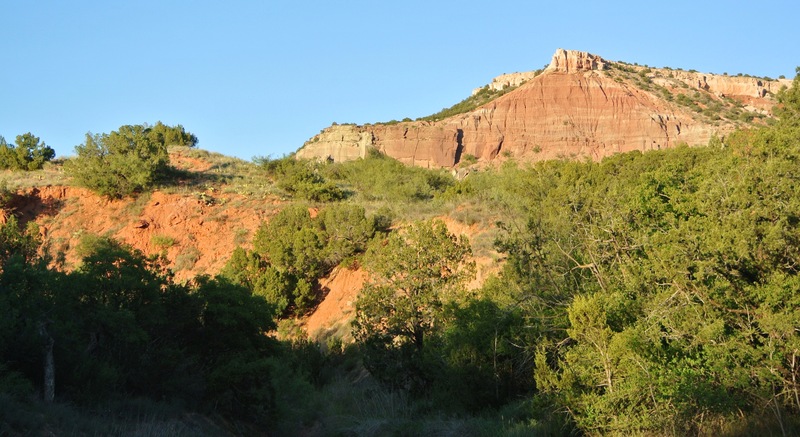 This series of gulches and valleys is located primarily in Briscoe County (where the third largest state park in the state is), but it continues winding its way north beyond the county line, widening until it reaches Randall County and forms Palo Duro Canyon of Comanche fame. 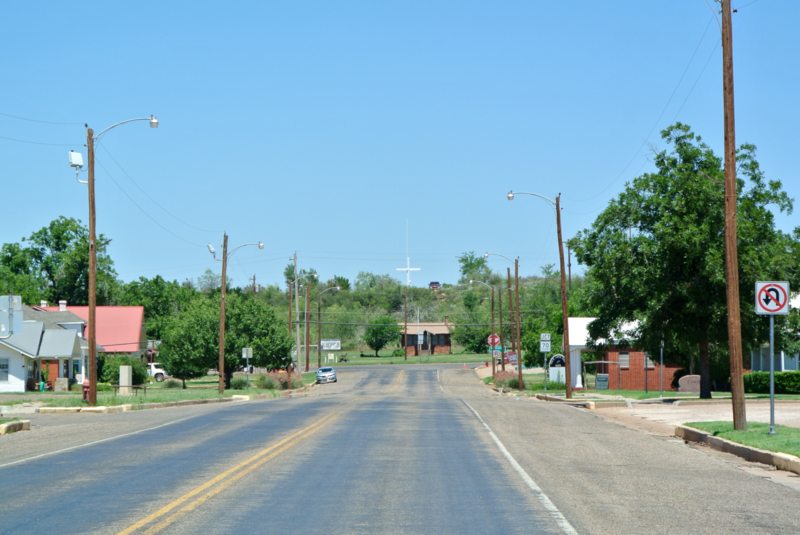 For now, we were arriving in Tulia. “The City With a Future” it calls itself. With a valuable location along the I-27 corridor, I suppose that’s feasible enough a name. 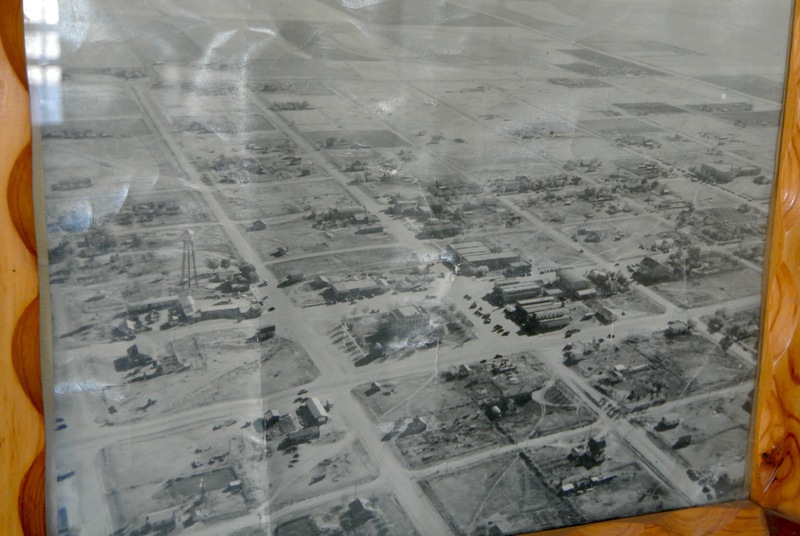 The land the city sits on was originally part of the Tule Ranch division of the area’s JA Ranch. 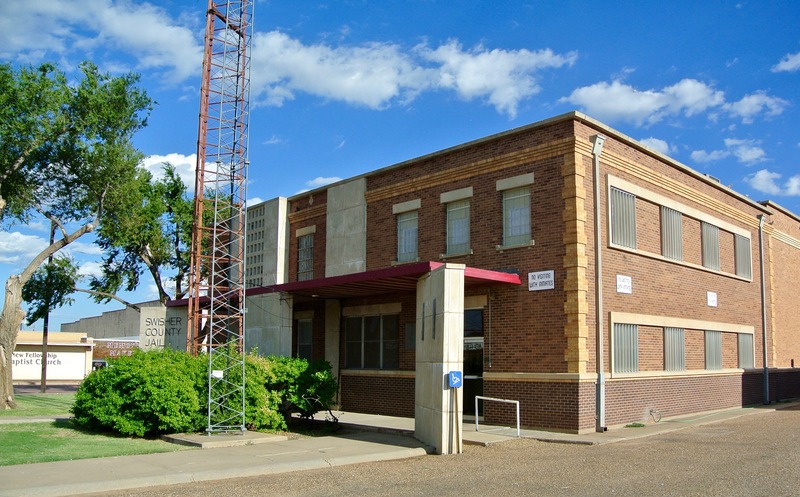 In 1887, a post office was established at a dugout nine miles west of modern Tulia and named Tule after a local creek. But as these things go, some post clerk made a fateful mistake. The town became Tulia instead. I’d love to know just how many cities in Texas were named due to a local postman’s abilities to spell…or lack thereof. I know Tulia isn’t the only one. When we arrived, it was edging on 6:00, and the square was “dead”, so to speak. There wasn’t much activity aside from the highway that forms the southern side of the square. Across the highway is a local Lowe’s Market, and that had some patrons, but other than that things were still. 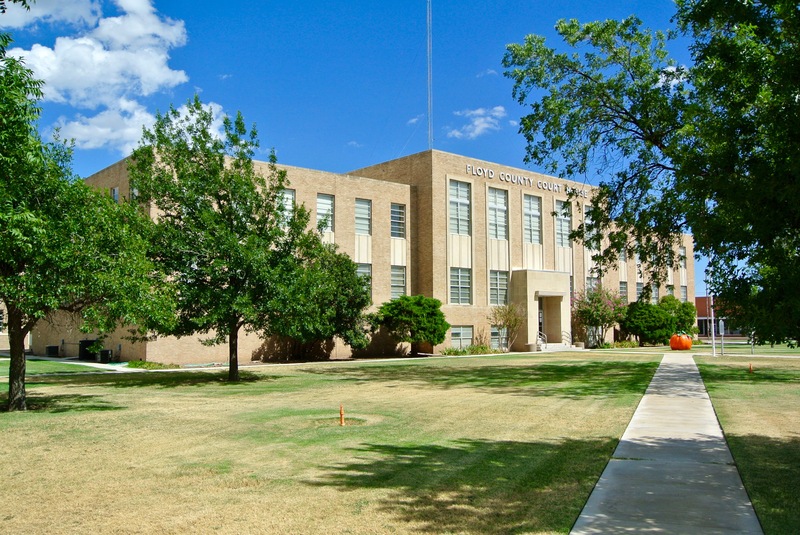 The courthouse was developed in 1962 by architects Rittenberry & Rittenberry. 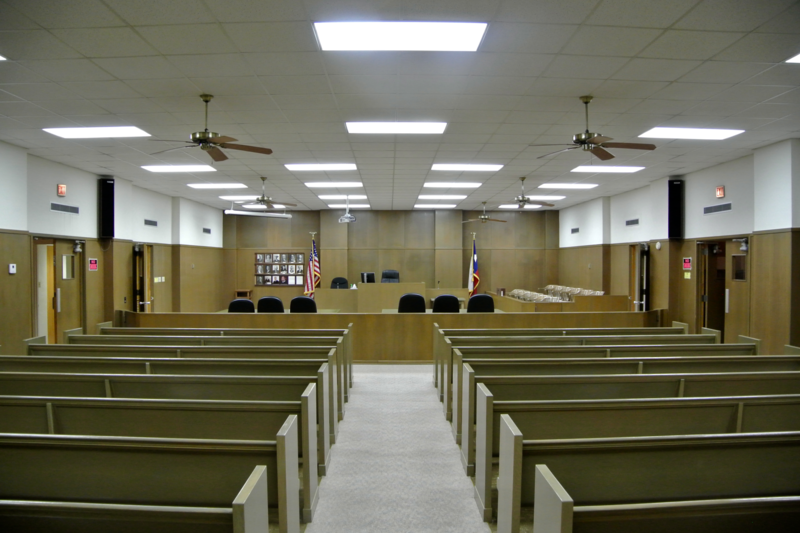 Their designs were novel, but they didn’t build this courthouse from scratch. It comes from the original courthouse of 1909, a towering construction of Elmer G. Withers. Withers, you might recall, was the same architect of the impressive Jones County courthouse I’d seen earlier that day. Of course, I didn’t know this at the time. I discovered this portion of Tulia history only after returning home. 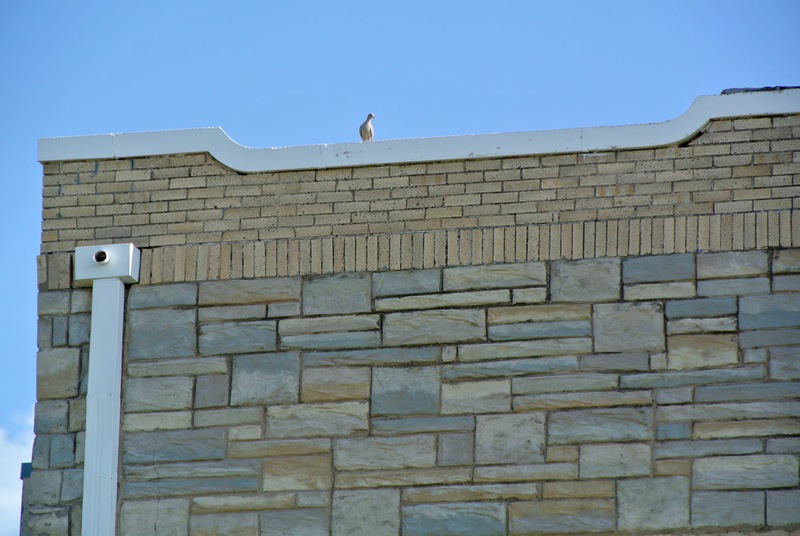 What the county did in 1962 was, following an internal fire, elect to demolish the elaborate details of their courthouse and “modernize” it by encasing it in a starkly unrecognizable shell of cement and brick. Today, this is what we have. I’ve seen better, but oh, have I seen worse. I mean no offense to the people of Swisher County. 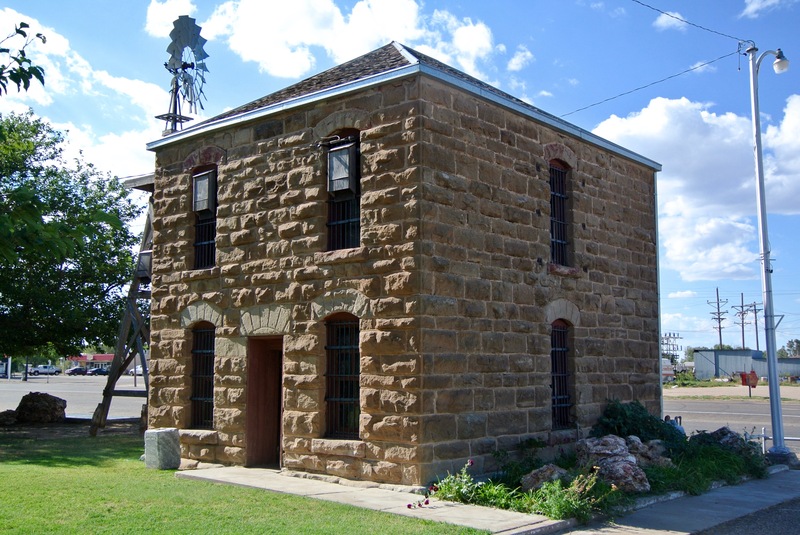 The Swisher County jail is just next to the courthouse, at its northeastern corner. I could swear that when I walked near it for a photo, I got whistled at by someone behind those bars. I made out of there quickly, I can tell you that. 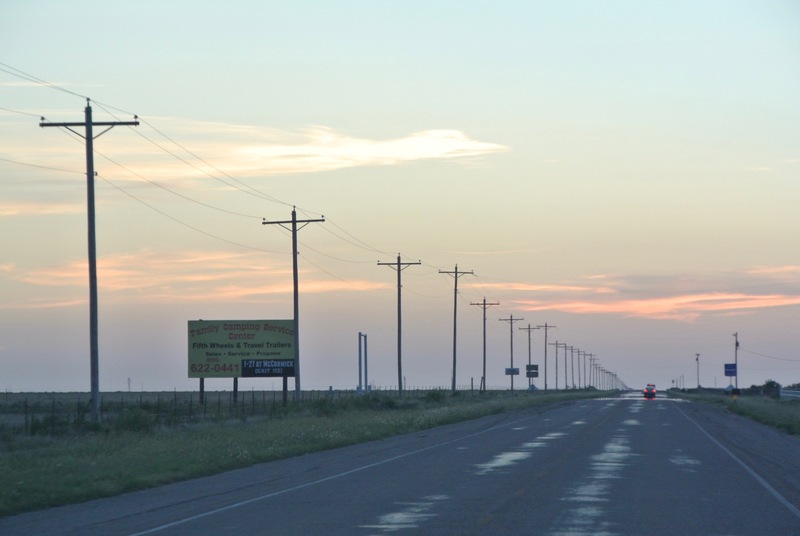 As we left Tulia, and set our sights north towards Amarillo, the sun had begun its gradual descent. After a full day on the road, dusk was finally setting. On peak summer days like this, I’ve always found that there’s more time for photography than any other period of the year. The sun is on your side more here than in any other season. I’ll admit though, there’s plenty times of day (the morning) and (sundown) when it’s also an enemy. Swisher County was the final courthouse stop of the day. 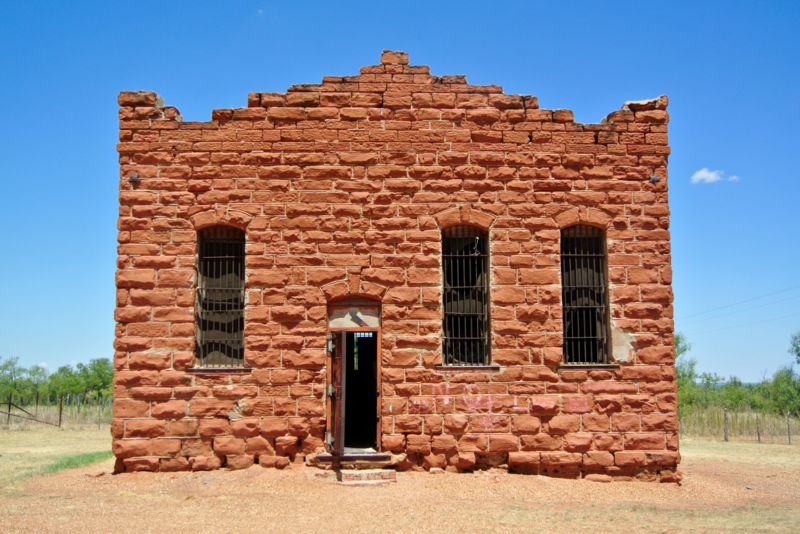 We elected to spend the night in Canyon, where Randall County’s courthouse was next, but I’d deal with that one in the morning. 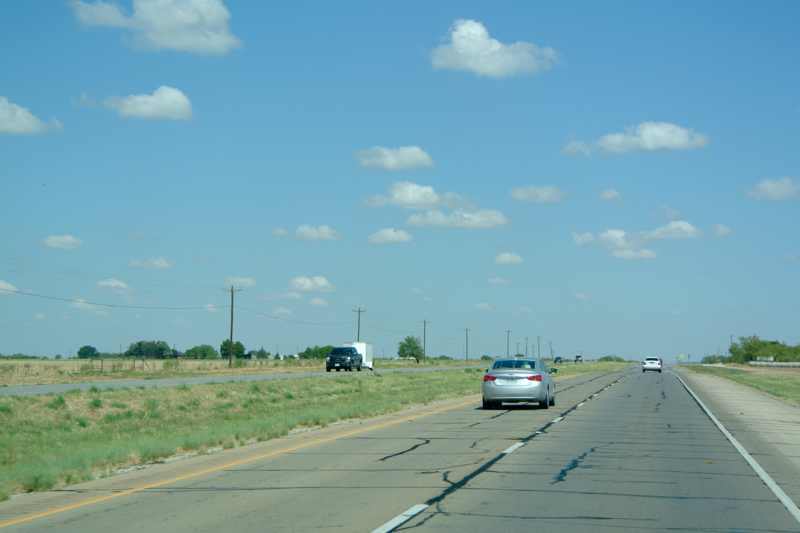 After traveling the distance on I-27, we reached the eastern outskirts of Canyon. A turn left, and we’d be taken downtown. 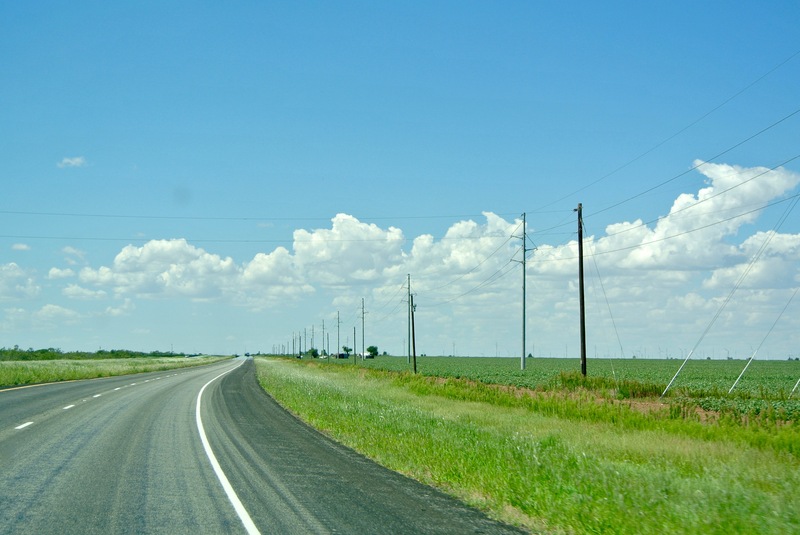 We decided to turn right, on TX-217, a lonely state highway stretching off into the eastern plains of Randall County. 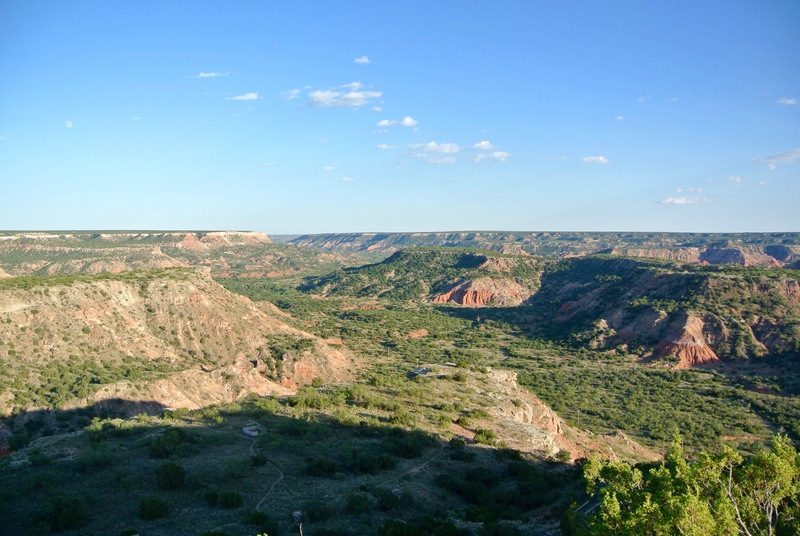 Palo Duro Canyon is the second largest canyon in the United States, only surpassed by the obvious. 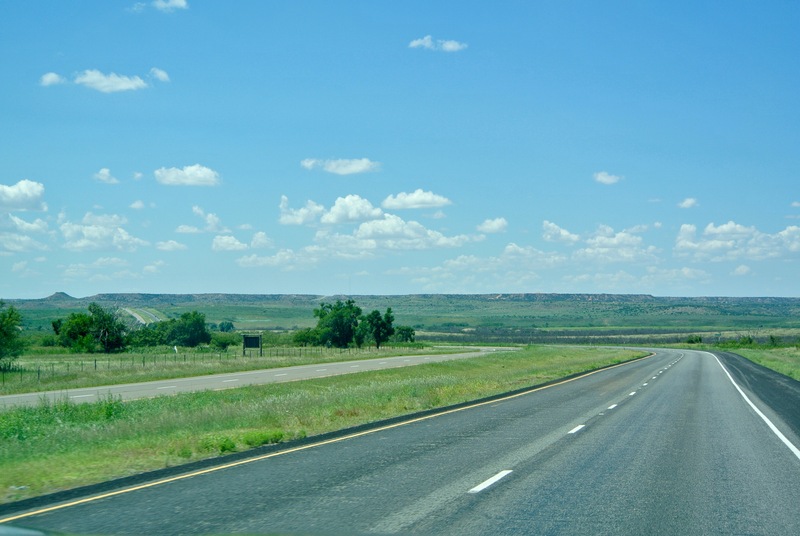 It is approximately seventy miles long, and has an average width of six miles. However, there are portions that can widen to as far as twenty miles. The approximate depth is 820 feet, but similarly to the width, some parts can greatly exceed that number (to around 1,000 feet). Dubbed the “Grand Canyon of Texas” (for good reason), it has become known for its multicolored rock layers and steep mesa walls (which makes the canyon bear some significant resemblance to that other one out in Arizona). 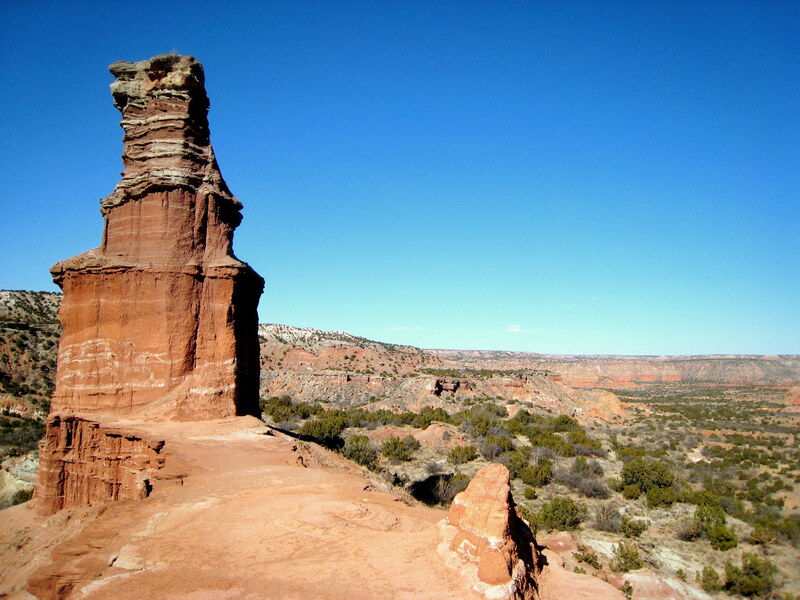 Today, as part of Palo Duro Canyon State Park, it has become well known for its caves and notable hoodoo rock formations. The most famous of these is called “The Lighthouse” and is only accessible by foot. We parked the car in a small lot adjacent to an observation area at the top, and I was able to take some pictures. It is truly a phenomenal sight to behold. A helpful guide points out some of the noteworthy formations. After hanging out at the top for a little bit, we decided we’d try our luck and see what there was to find in the valley itself. Unlike the Grand Canyon, this one is descendable by a small park road. 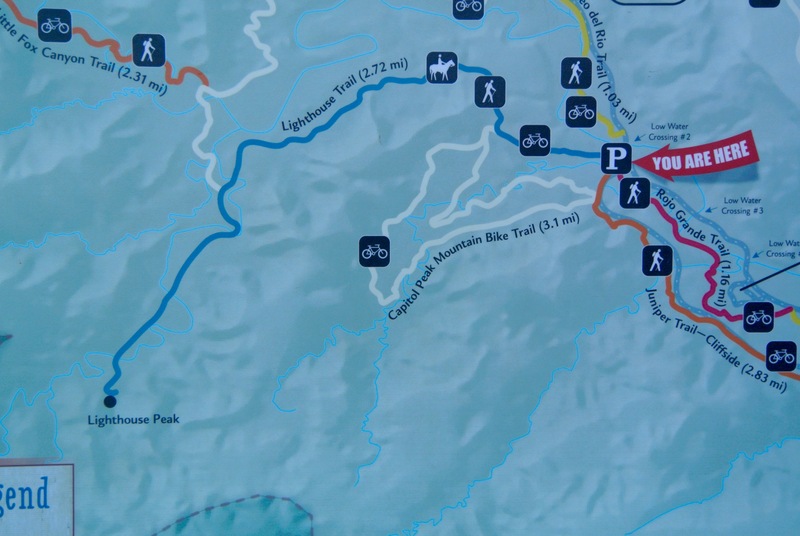 At its basin, you can find a variety of camping locations, trails, and even a visitor’s center. 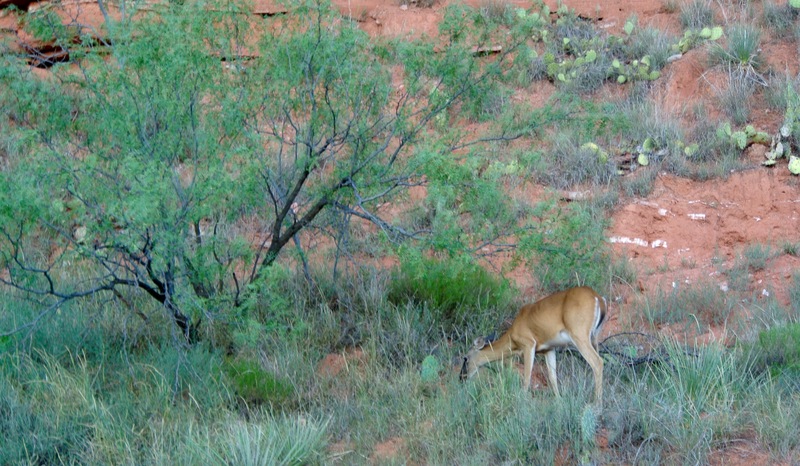 By the time we reached the canyon floor, the animals had started to come out for the night. About halfway through the park we found the turnoff for “The Lighthouse”. I’d heard of this formation before, and was eager to check it out. However, I’d had my suspicions that there was no road to it (as there was none labeled on the map the park warden had given us upon arrival), and now my fears were confirmed. I suppose in an effort to maintain the natural integrity of the formation and its side of the park, no road was ever built. Instead, the adventurous can hike six miles roundtrip out to see it. 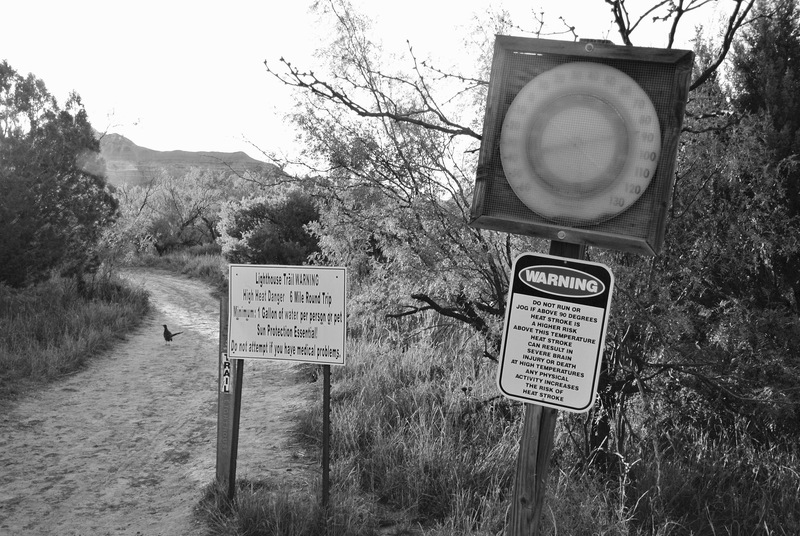 There are explicit warnings at the entrance to the trail about taking the proper precautions under the mid August sun. I’ll have to come back. A lone roadrunner was the only one willing to head out to the Lighthouse that evening. I understand that this formation in the distance is not the Lighthouse, but it’s close enough. I really wish I could take credit for this wonderful photograph, but it’s not mine. This is a view of what this Lighthouse looks like, so you can get an idea of what I missed. So we moved on from the entrance to the Lighthouse Trail and found our way to a little creek at roughly the halfway point of the park’s main loop. There, we stopped and looked for arrowheads for a minute or two. I didn’t expect to find any, but it didn’t hurt to try. 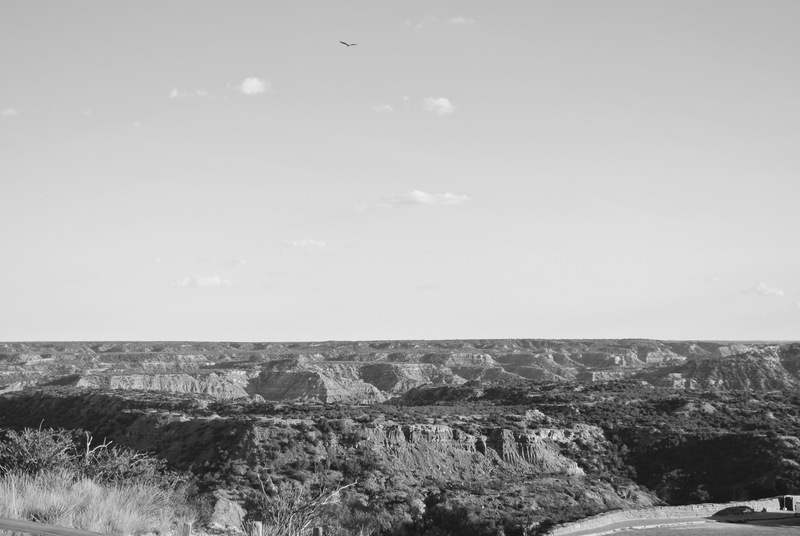 We assumed there was a chance since this canyon was once an area of importance to the Comanche tribes that roamed this region. 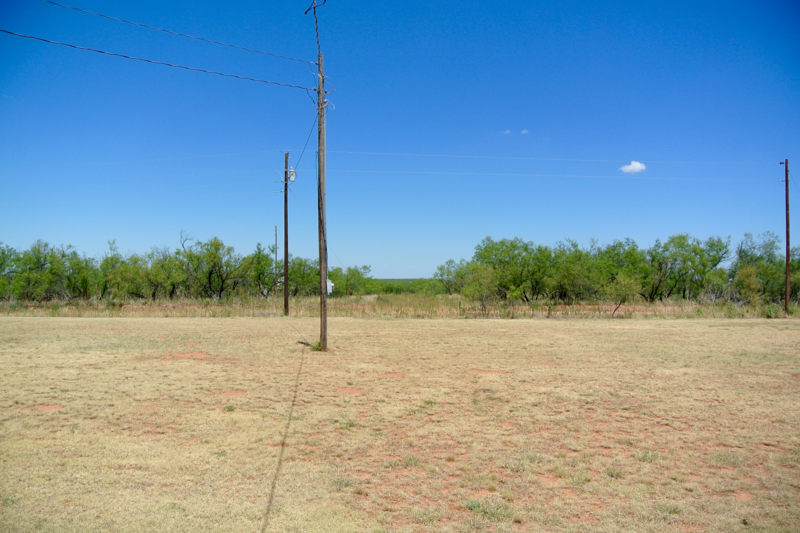 In fact, this was the site of one of the most pivotal moments in Texas History. Among these hills and mesas, the Comanches made their last stand against Colonel Ranald S. Mackenzie and the US Army. They were the final group of Native Americans to be relegated to reservations in the 1860s and early 1870s, and had evaded the Army for the full extent of the Red River War (Texas’ theater of the Indian Wars). Their luck ran out on September 28, 1874, nearly three months to the day after the Battle of Adobe Walls. 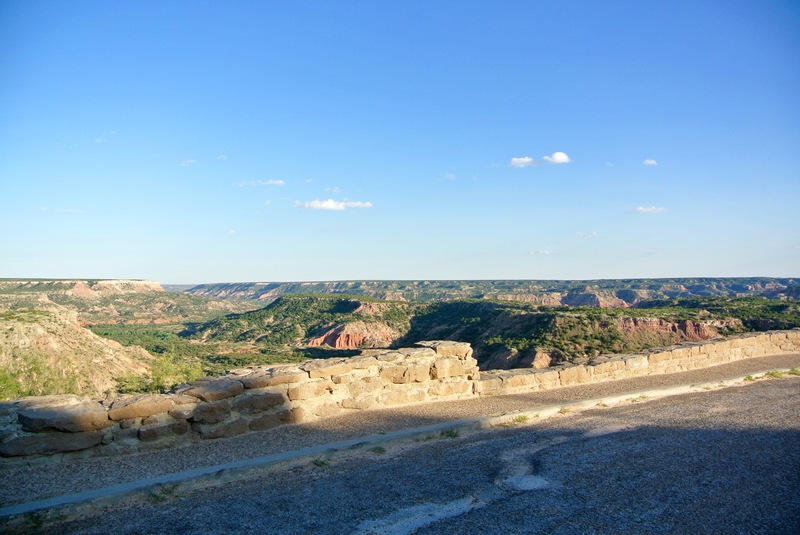 In the upper canyon, not far from where the state park now exists, a large village of Comanche, Kiowa, and Cheyenne natives had been constructed to house their winter food supply and many of their horses. There, they naturally felt secure by the steep canyon walls enclosing them from attack. That’s why they were taken by surprise on the morning of September 28, when Mackenzie and his troops attacked down the side of one of the mesas, invading the village and giving the Indians no time to gather their supplies before retreating. This was the largest Army victory in the Red River War not because of lives taken (only four natives died), but rather because they burned 450 lodges, took 1,400 horses, and destroyed unfathomable pounds of buffalo meat used for nourishment. This band of Indians had found itself retreating on foot, a condition nearly unheard of among the equine-cultured Comanches, and without any food. There was, essentially, no choice but to surrender to a reservation. Nine months later, the final sizable band of the final rogue tribe surrendered to the United States. These were the Quahadi Comanches, led by the legendary Quanah Parker. 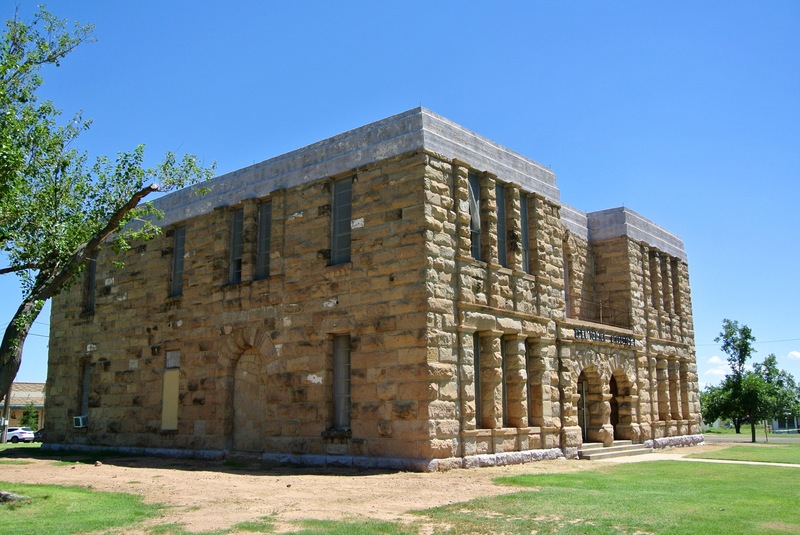 In June 1875, Parker was finally forced to abandon his efforts to evade surrender, and he turned himself over to US officials at the Fort Sill Reservation in what is now Oklahoma. With the largest band of the area’s roaming Indians now out of the way, and the virtually complete extermination of local buffalo populations by the Army, the Panhandle was at last open to permanent settlement. 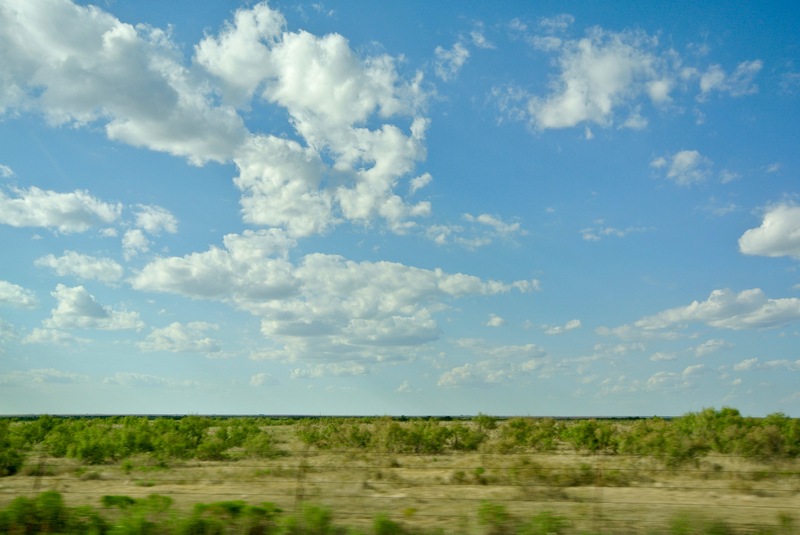 Thus began the chapter of Texas History when counties were charted, plotted, named, and organized, tiny ranching communities became county seats, and courthouses were built where only decades before buffalo herds and Comanche tribes had roamed. I wanted to see if there was some kind of memorial at the battleground of this conflict, and so while we nearly turned around and left the park midway through, we pushed onward to the end of the loop. There, my map maintained there was some sort of marker. 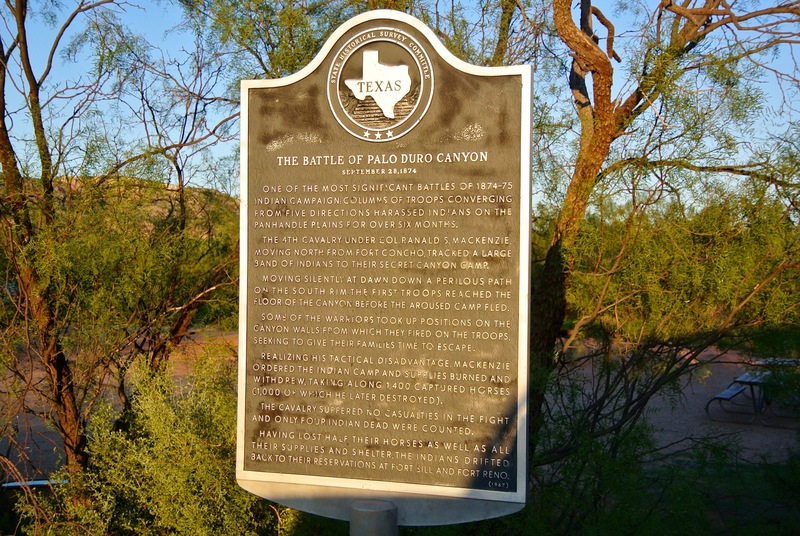 Sure enough, there was, but it was just a single Texas Historical Marker detailing the battle. I was expecting a kind of monument or a sign indicating that this was where the village was. 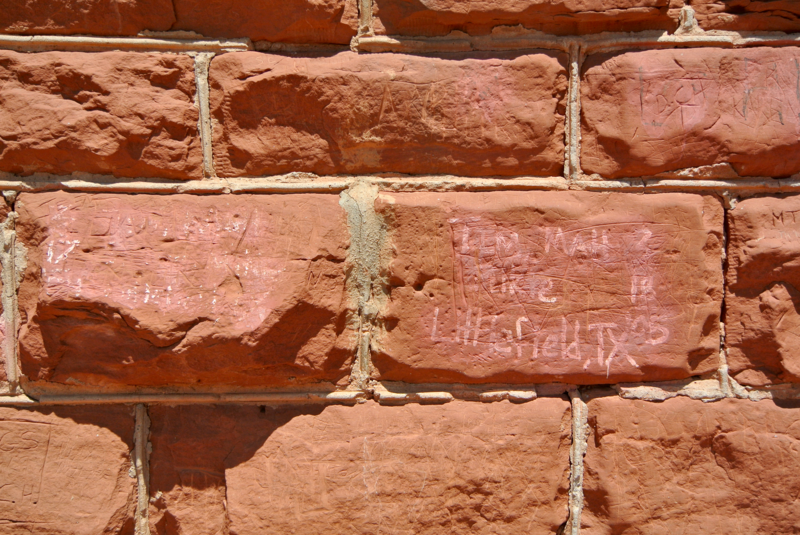 A little something to the effect of the site at Adobe Walls would go a long way, if you ask me. This is the area directly adjacent to the marker. Whether correct or not, this is where I imagine the battle could have taken place. Also, this is where the park road ends. 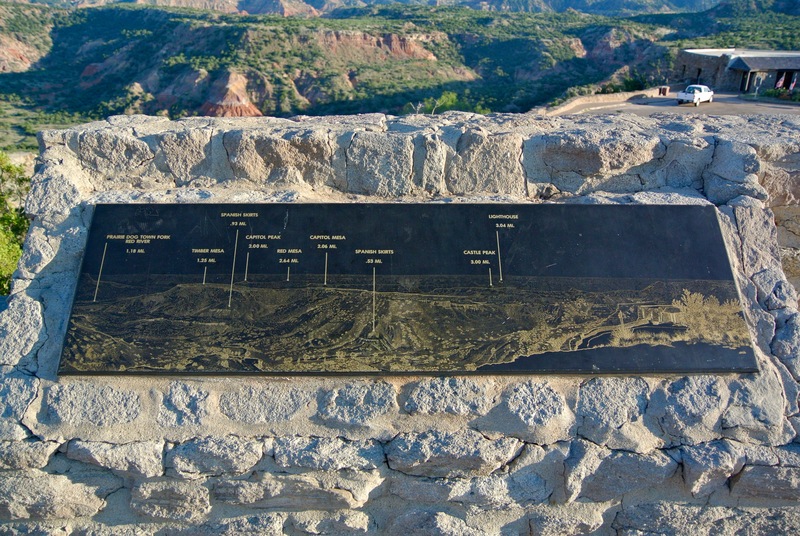 The rest of Palo Duro Canyon winds its way back south towards Caprock Canyons and Briscoe County (and is not open to the public). So we got back in the car, and found our way back down the long park road to the hill we entered the canyon on. By the time we resurfaced, the sun had just eclipsed the horizon. 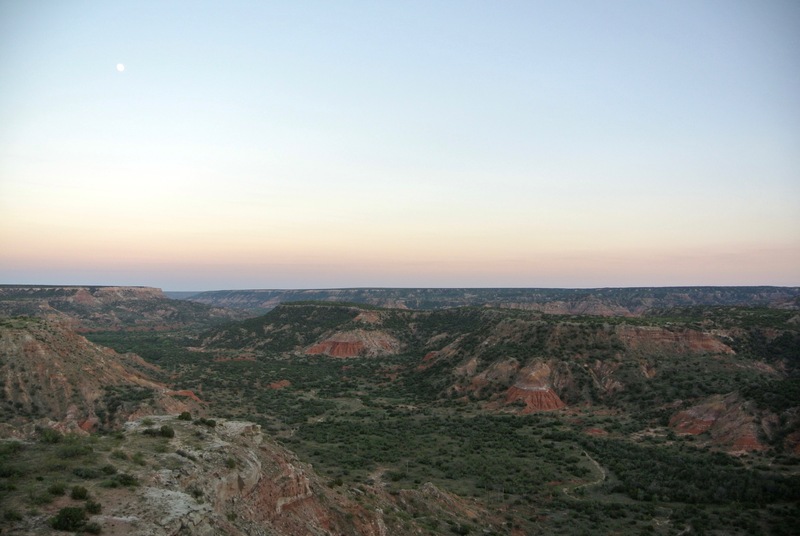 With a hearty goodbye to Palo Duro, our road took us west again, back to the city named after this amazing canyon. We checked into a local Holiday Inn and had dinner at the adjacent restaurant “Buffalo’s”. Let’s just say that Dairy Queen was my favorite meal of the day. Afterwards, we went back to the room and went to bed. This day had surely been full, but there was much to see tomorrow too.